Greetings from Miryante orphanage and school. We really love you all and we do appreciate all that you provide to us. 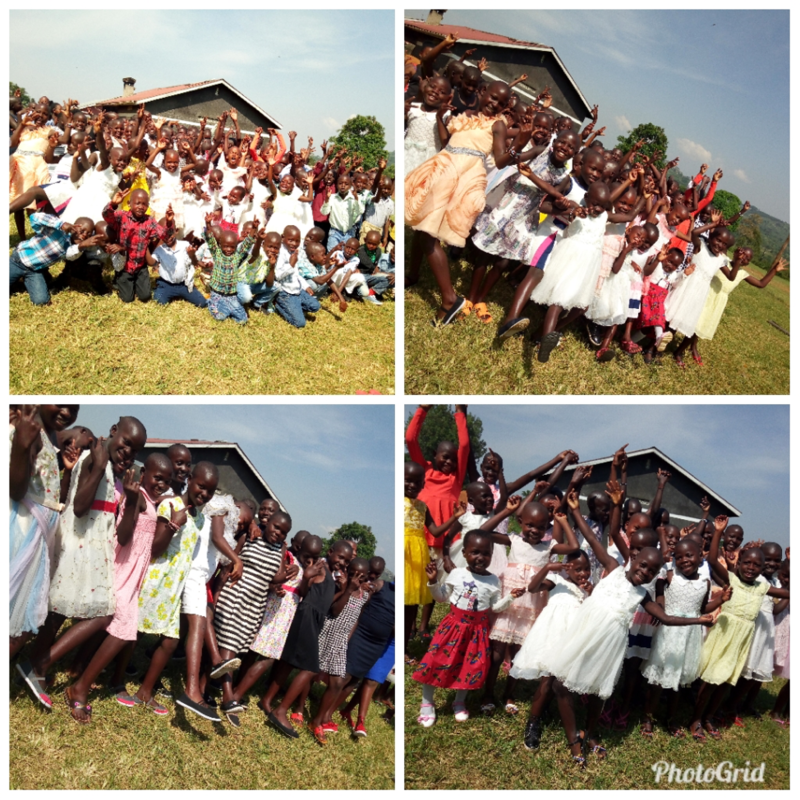 We shall begin with the great smiles from the children! 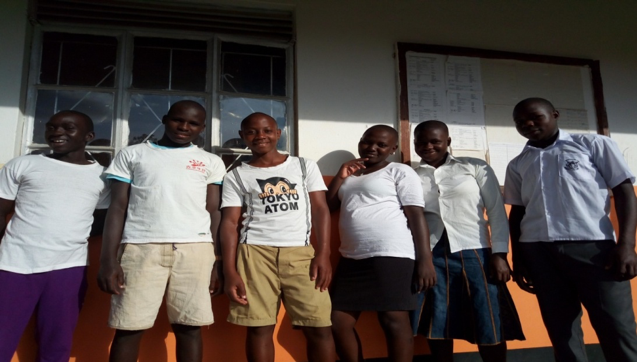 All of our kids are happy and healthy at the home and they all started school on 4th of Feb 2019. 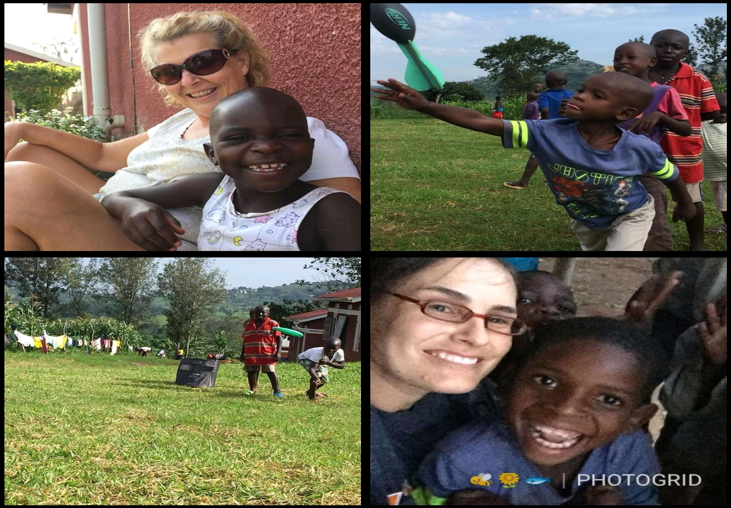 Under the guardianship program, every two weeks, social workers and counselors of Miryante visit different households to interact with the children and their guardians to check on their progress. 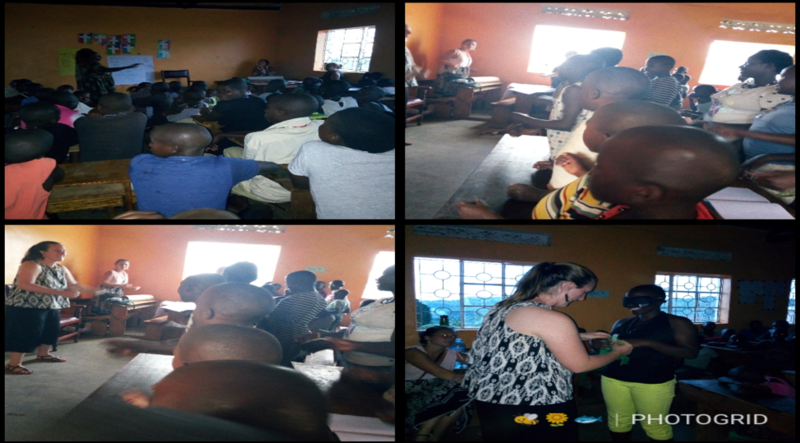 Whenever the children under the guardianship program and their guardians have some problems, our counselors go and talk to them. 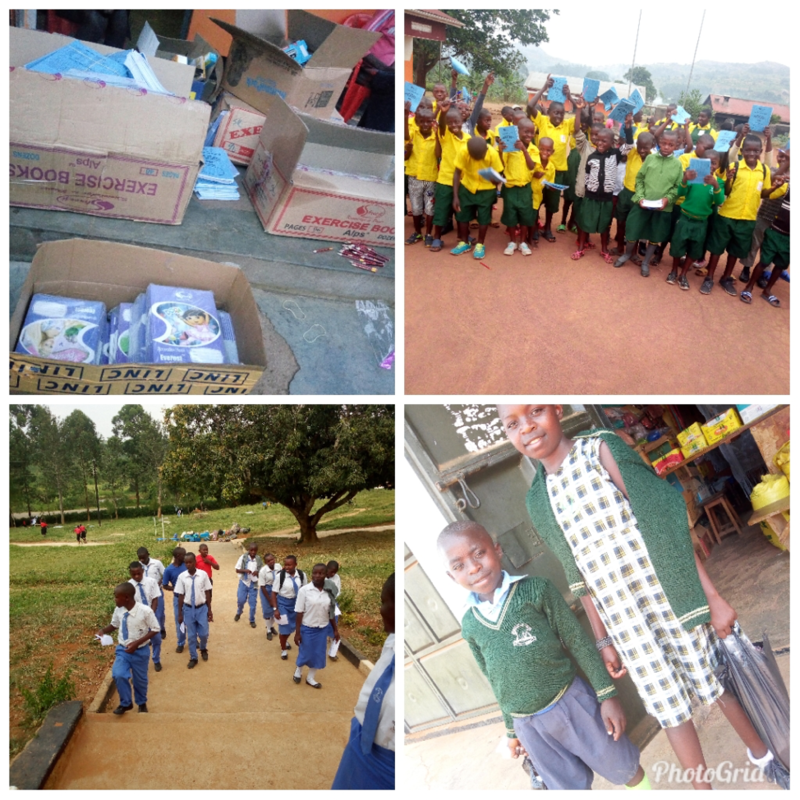 Pictures showing children who received scholastic materials as they return to school for the first term. 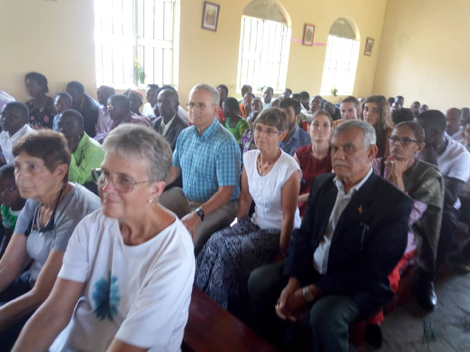 In February Alex’s husband Mr.Pankaj Taneja visited us. He donated story books, sweets and soccer balls to the kids. 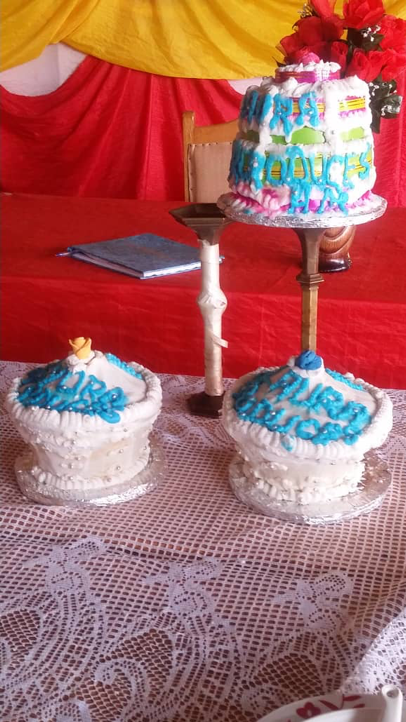 He also threw a party in the evening with the children and staff members to celebrate their engagement. 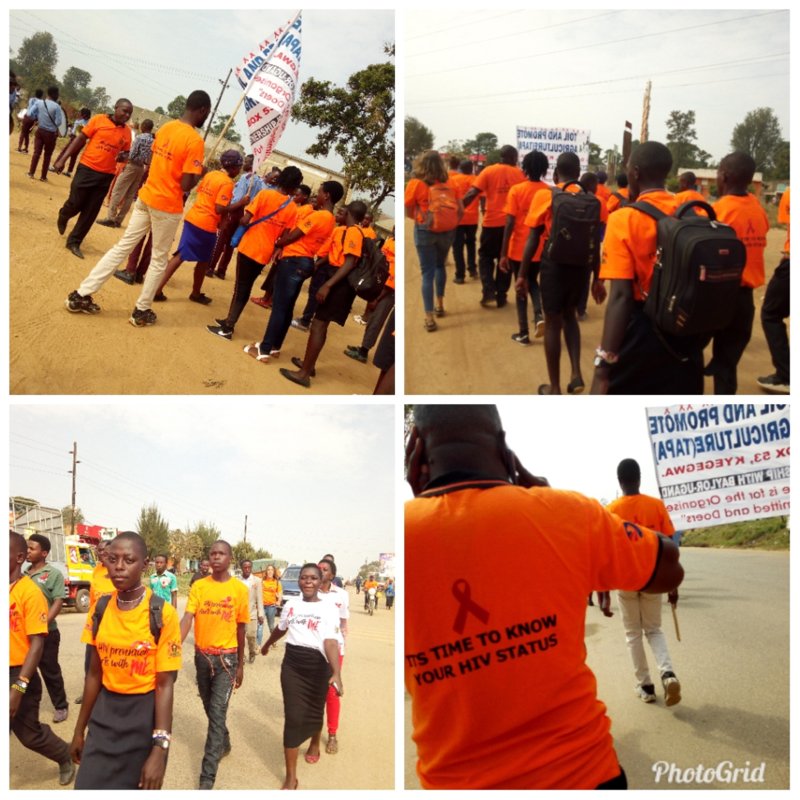 On the 14th of February, it was the Kyegegwa World Aids Day celebration. Miryante children and staff participated in this day. 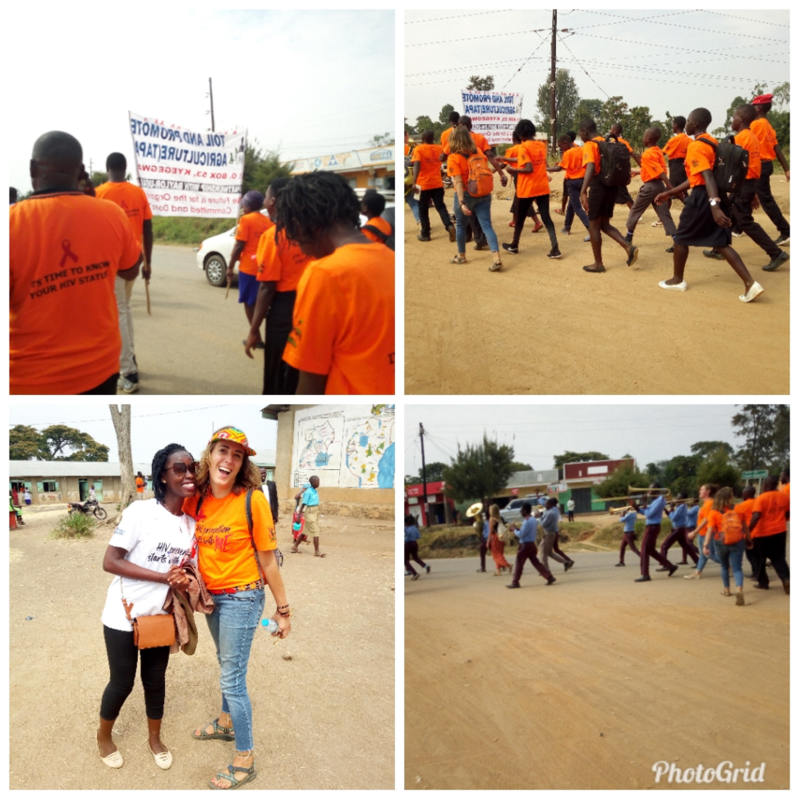 Pictures below show the Miryante team and other organizations marching to Kasule Primary School where the celebrations took place. On the 11th of February, we managed to rescue a baby girl and we were able to work with police to find the mother. The baby was 9 months and we suspected the baby had been stolen from her mother. The baby stayed at Miryante for some days where she was being taken care off. 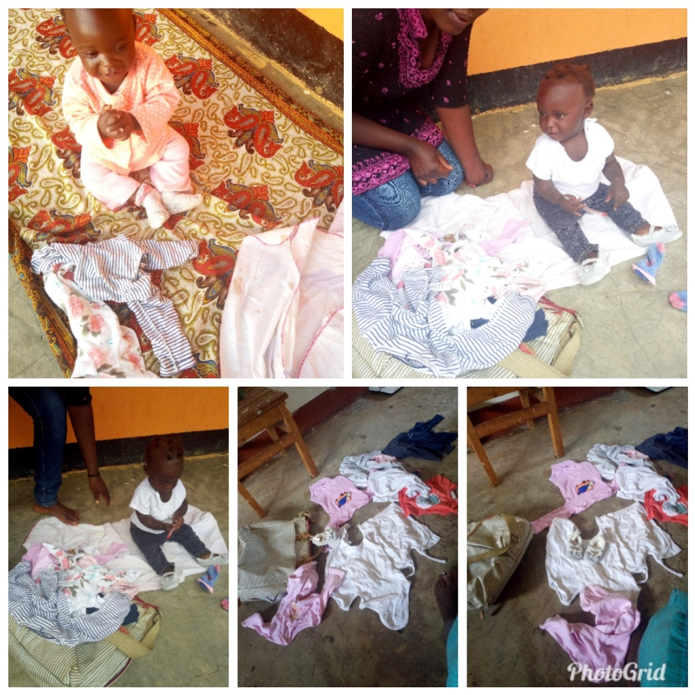 We were able to donate some clothes and shoes, and later we handed her over to the mother with the help of police. 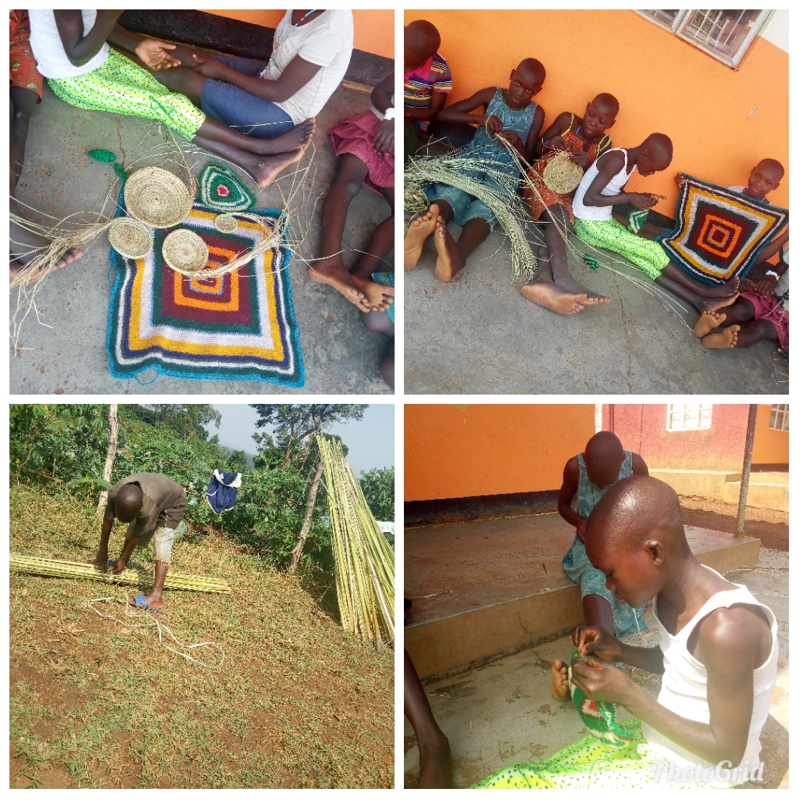 On weekends, our children do some handcrafts such as weaving baskets and table mats. 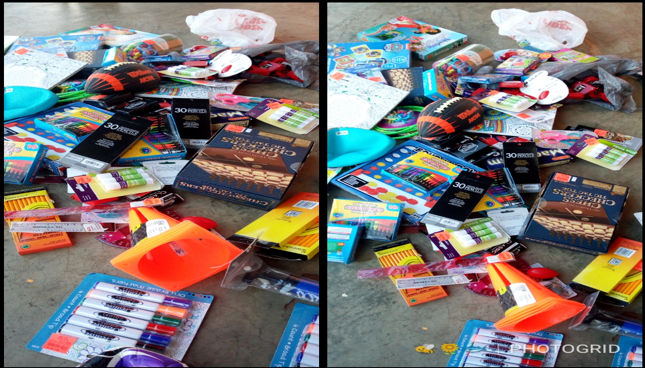 On 23rd the of Feb, we received some donations of books, pencils and pens from Laura’s friend, Sawan. The planting season has also began. 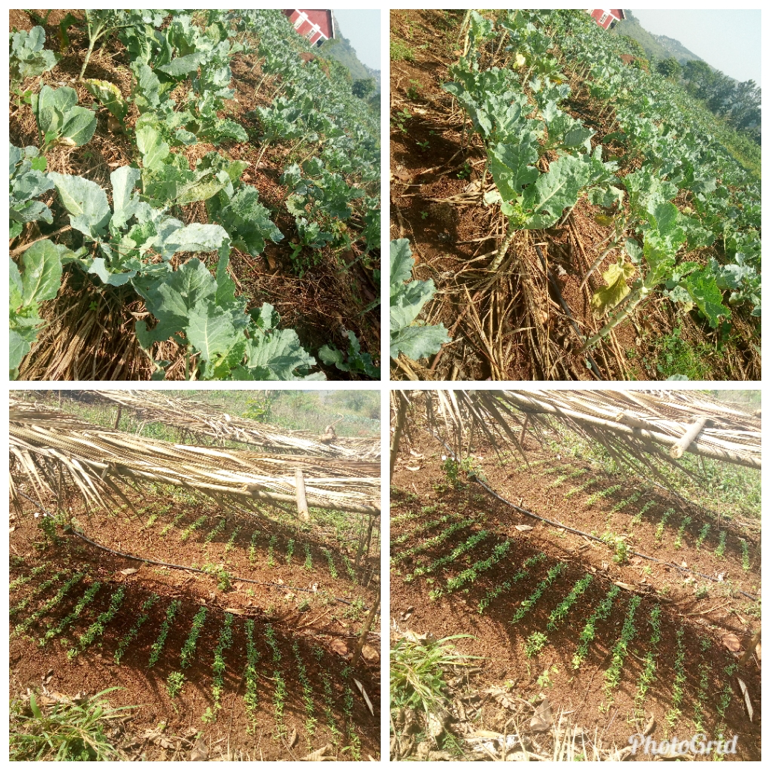 Pictures below are showing our nursery beds which have tomatoes, green paper, eggplants and kale seedlings ready to be transplanted. 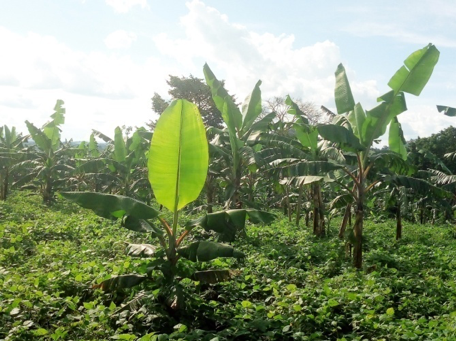 We are also looking forward to expanding the banana plantation and planting more crops such as soybeans, cowpeas, maize, Irish potatoes and pumpkins to have enough foods for the children. We are really so grateful for the support we want to say a very big thanks as management! 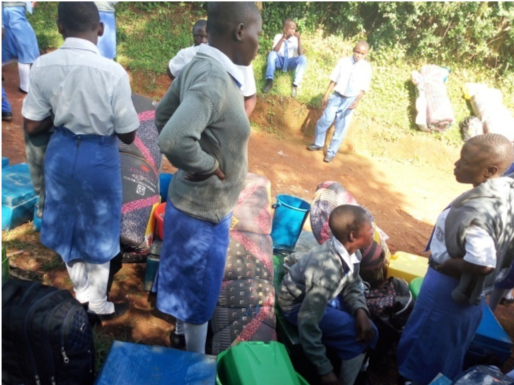 Schools opened on 25th of January 2019, all of our children are in school. 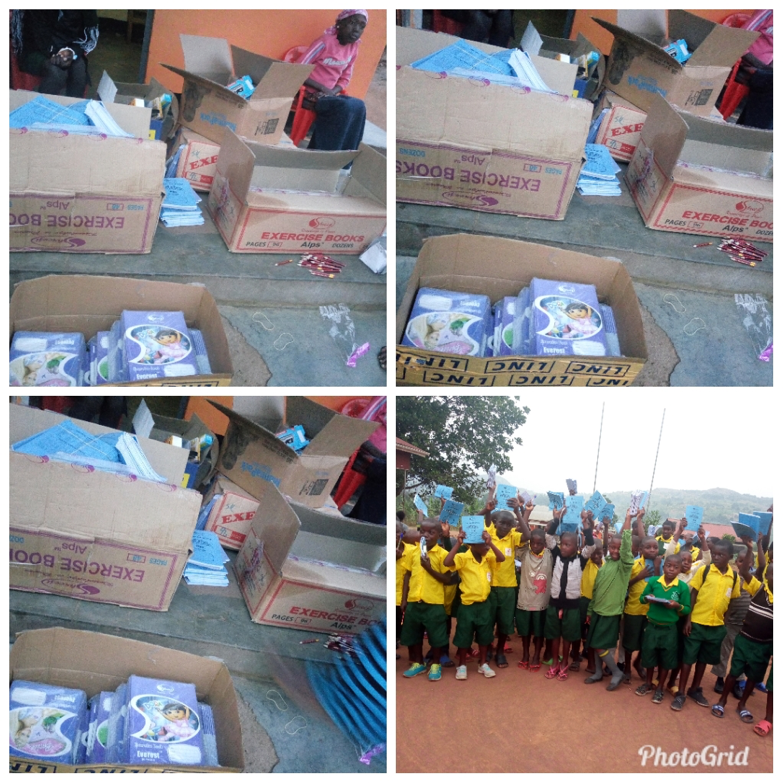 Below are Pictures showing children receiving their scholastic materials before heading to school. 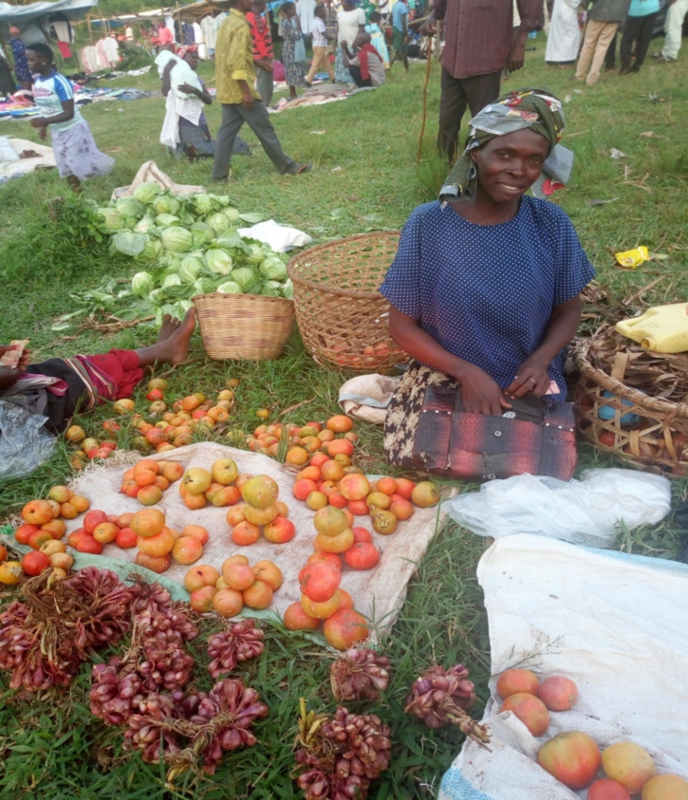 Below is another Picture showing one of the guardians of household number one selling tomatoes and onions during a market in Migongwe trading center. 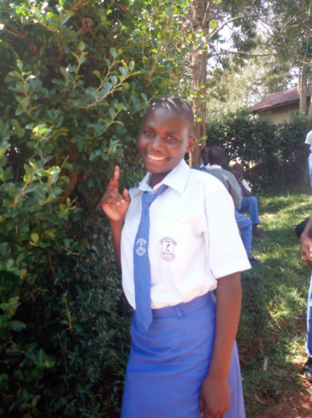 Miryante has helped her to start a garden to support the children she is fostering. 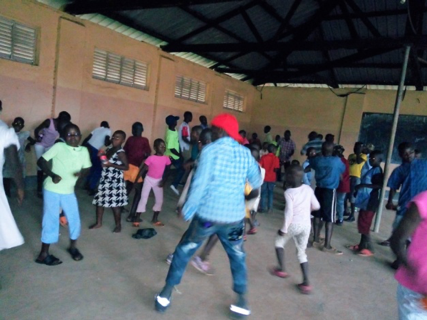 During this January holiday, the children had different programs to keep them busy. 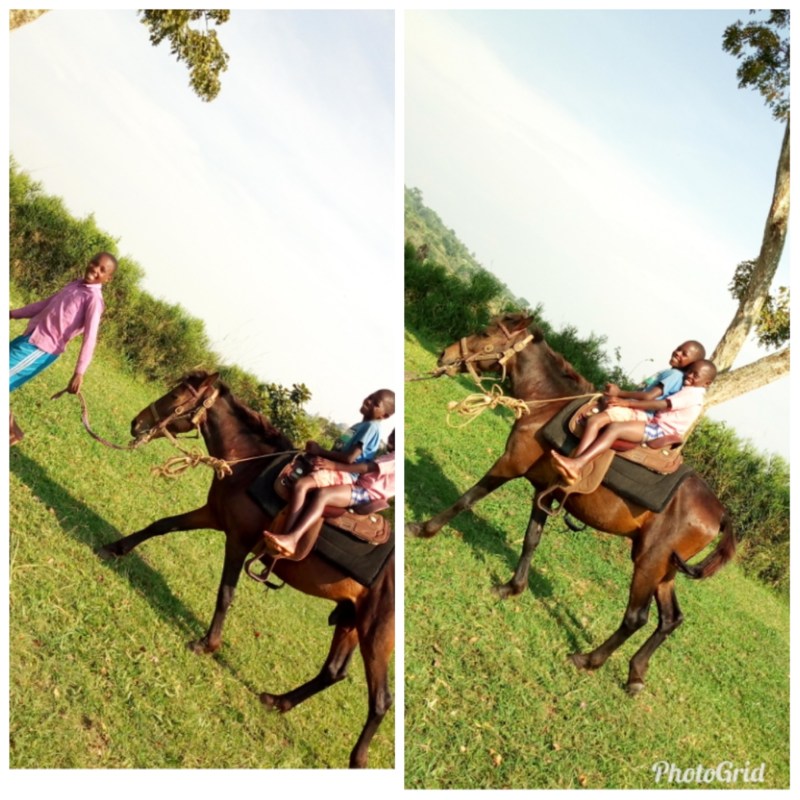 The major one was learning how to be friendly to the horses and to learn the horses’ language. We have done this by going on different hikes and giving the horses baths. This is done with the help of madam Laura and Aman as shown below. We have already received 60 boxes of manapack rice for the first quarter. 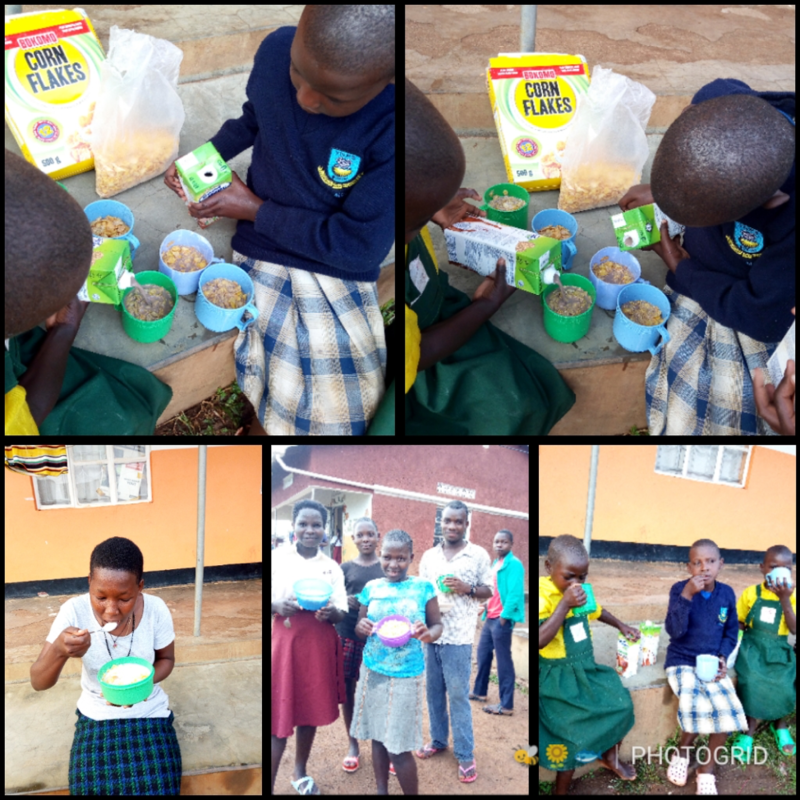 This food has been of great help towards the children’s diet. 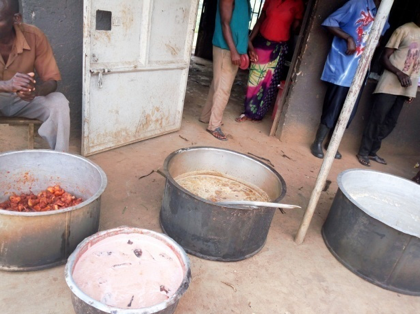 The biggest number of children we get at the home come when they are malnourished. Manna Pack rice has been the best food ever for the children’s diet. 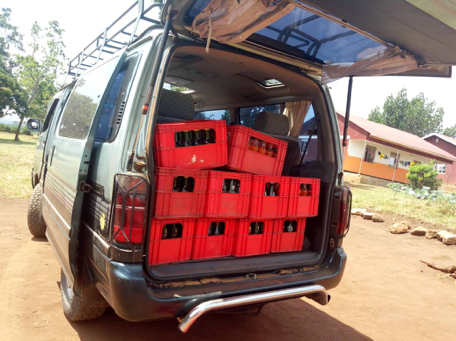 Below are the 60 boxes we received for the first quota in 2019. Thanks to Anna Lisa that has always thought about us at Miryante Orphans Home. 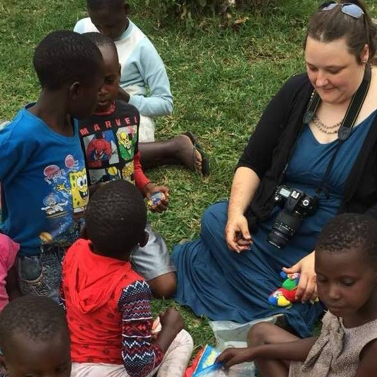 Our Peace Corps volunteer, Alex, organized special Bible and nature classes for our children this January. These classes have been taking place Tuesday and Monday of every week. 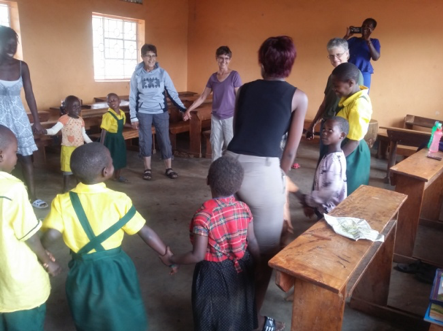 The children are taught how to sing songs and play games about nature and animals. 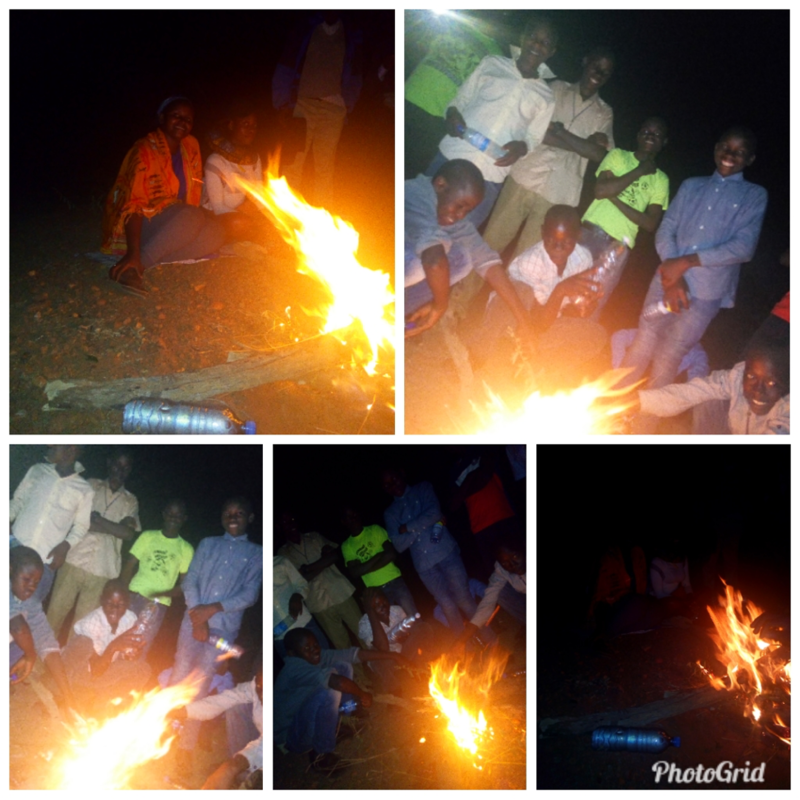 Below are pictures showing children in the nature class and Bible classes. Our cows are doing very well and so far four baby calves have been born. This means more milk for the children. 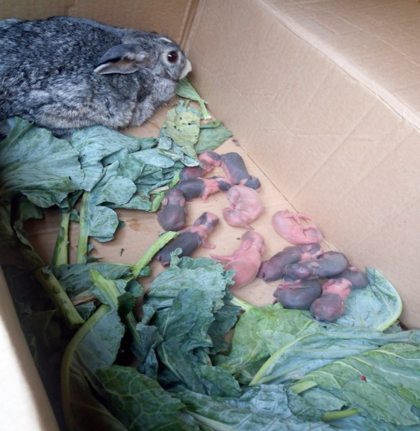 Also, at last our rabbits gave birth to 11 little ones as shown below. We are really grateful for all the support as we start the 2019 year. Thanks very much! 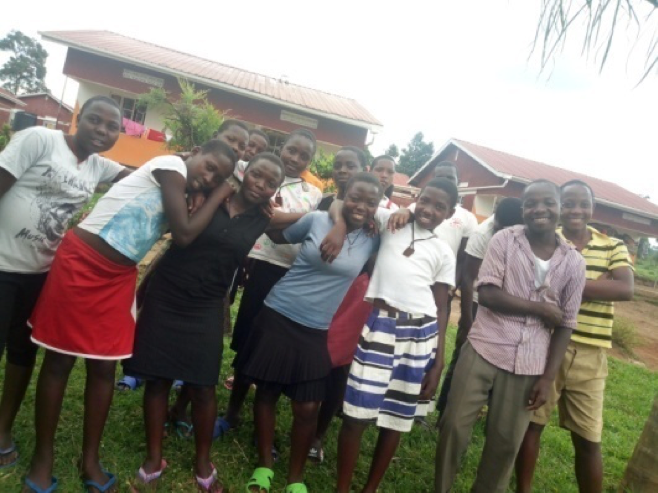 Greetings from Miryante Orphans Home! We are really grateful for the support given to us here. Everyone is fine and very happy about the Christmas season. 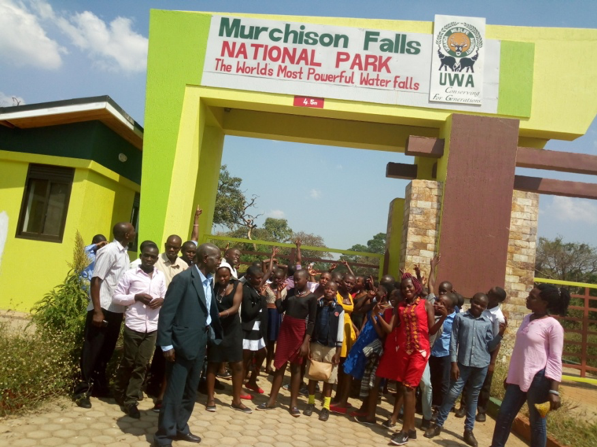 The children couldn’t wait to go out for shopping, carnival, and the trip to Murchison Falls National Park. 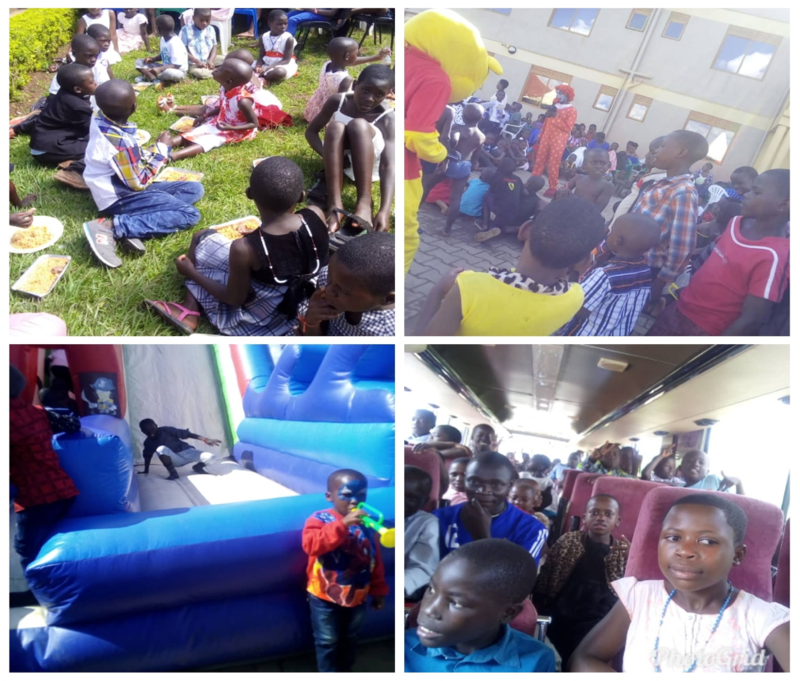 A huge thank you to Inno-pak for sponsoring the Christmas trips and everyone who gave to make Christmas special for the children. The excitement was too much. 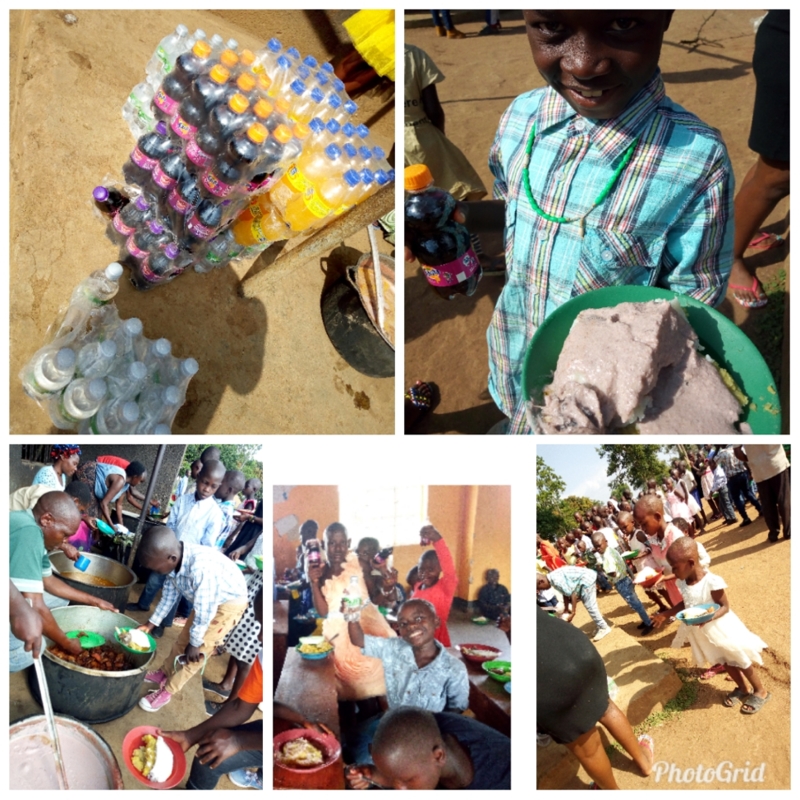 We also gave the children the task of being on their best behavior to be able to enjoy the above Christmas privileges. 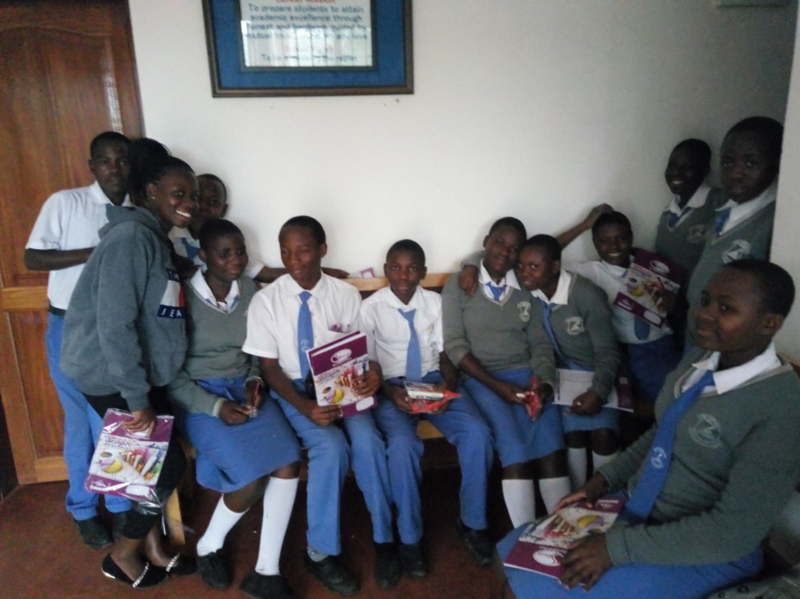 Academically, the children performed well, and all were promoted in their respective classes. 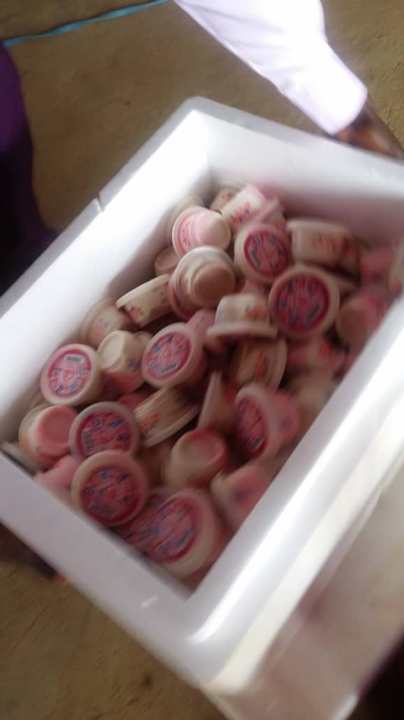 They all officially broke off for break on the 30th of November 2018. For Christmas shopping, the kids were too excited. 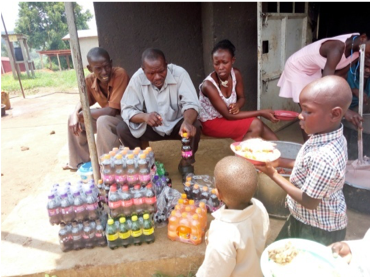 On the 15th of December they were helped by the caregivers to go to the market. 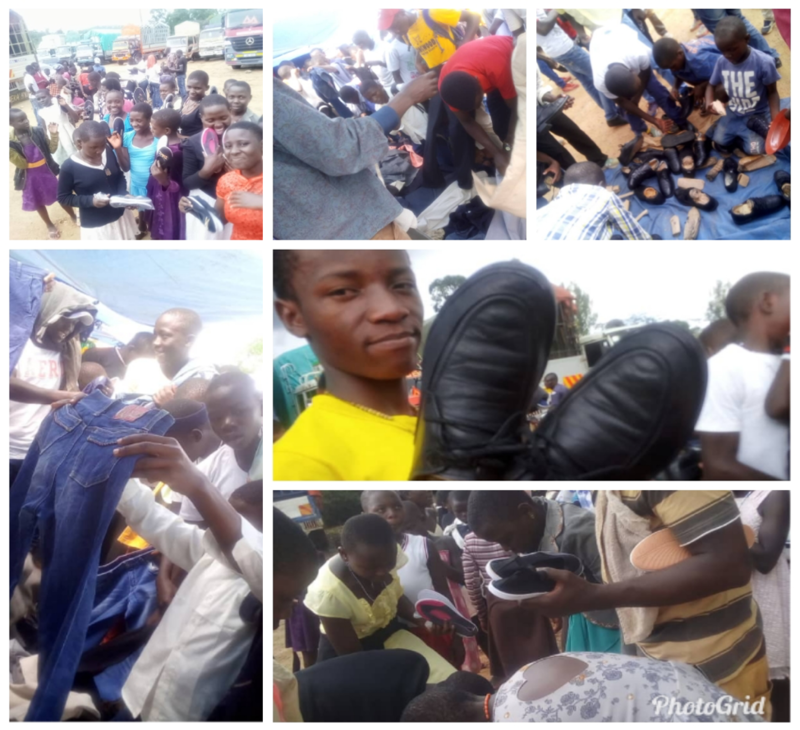 The boys bought 2 trousers each, a belt, closed toe shoes, 4 pairs of underwear, 2 shirts, lunch and later a drink on their way back. 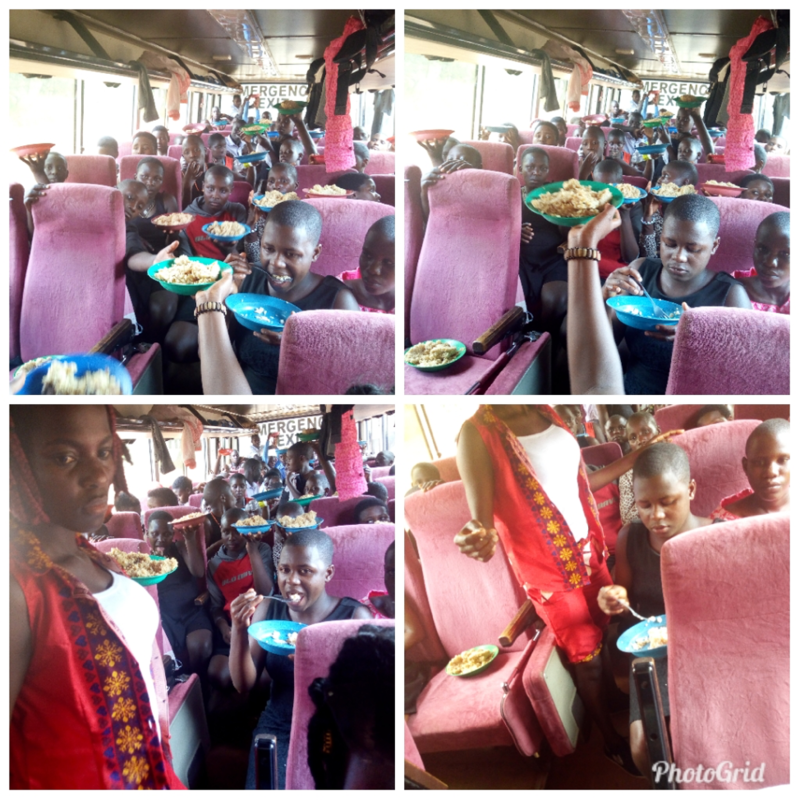 All the girls bought two dresses, shoes, 4 knickers, and also a lunch for each and a drink on their way back from Mubende where they did the shopping. At the beginning of December, we also received 3 horses from Laura’s family and friends as a gift to the children for her recent wedding. We are really blessed as one of the luckiest homes because in the whole region you cannot find horses. The kids ride these horses every day. 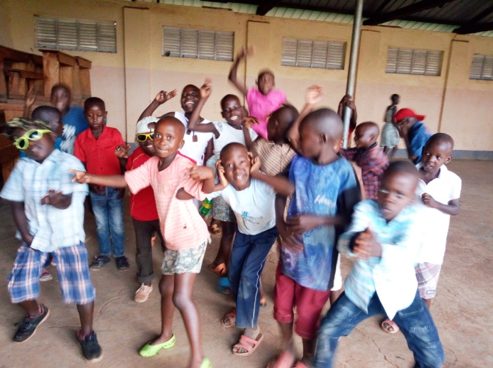 Our children really enjoy having them around the orphanage. The horses are beautiful with the children. 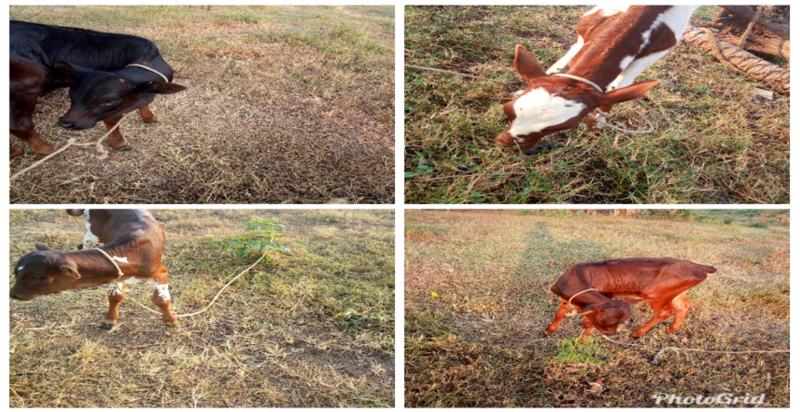 We greatly thank Laura, her husband Ambrish, and all her family and friends because we now have horses on the farm. 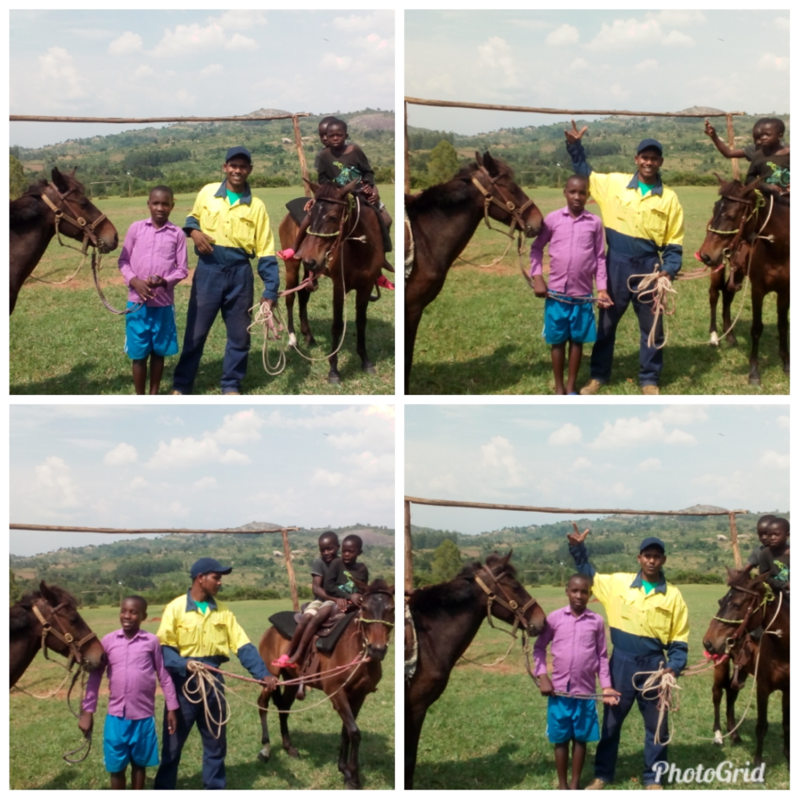 They have even hired someone to help train the caregivers and children to help us learn the language of horses and how the children can work with them. 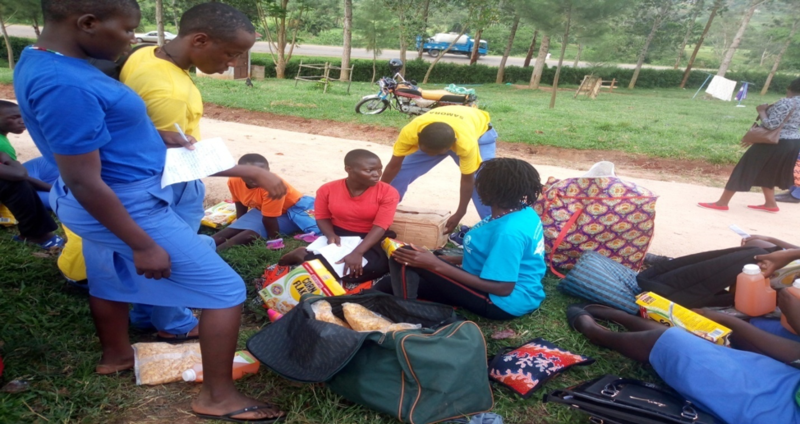 We also managed to give awards the best four best dormitories and that was St. Joan (1st place), St. Gyavira (2nd place), St. Theresa (3rd place) and St. Thomas (4th place). They were given the award for having the best hygiene and the best dorm garden. 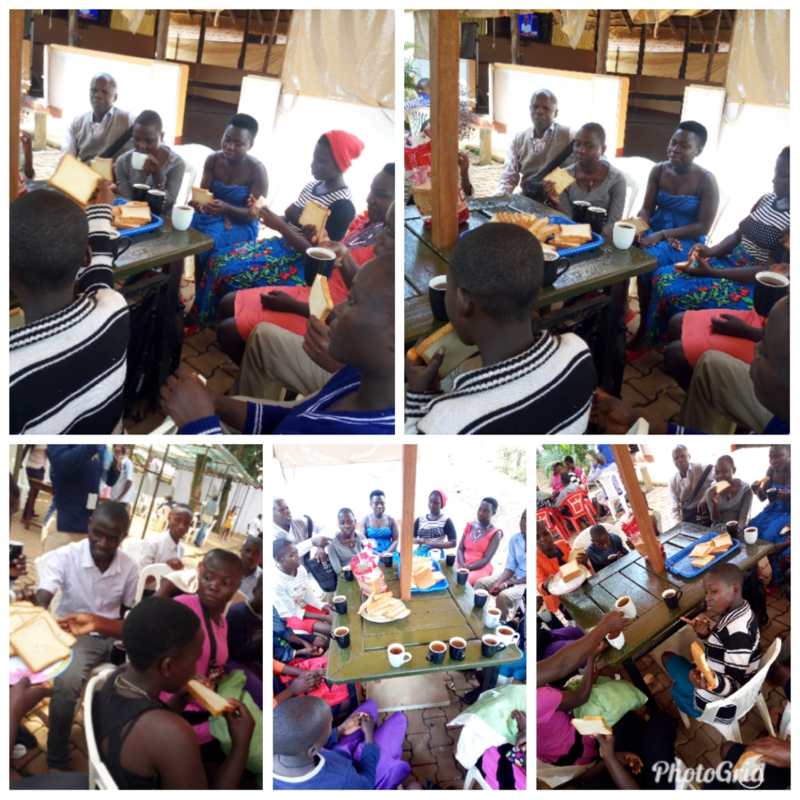 As an award, we gave them a period of one month to come up with a project of their choice that to be managed by the children per dormitory that will be reported to you in January newsletter. 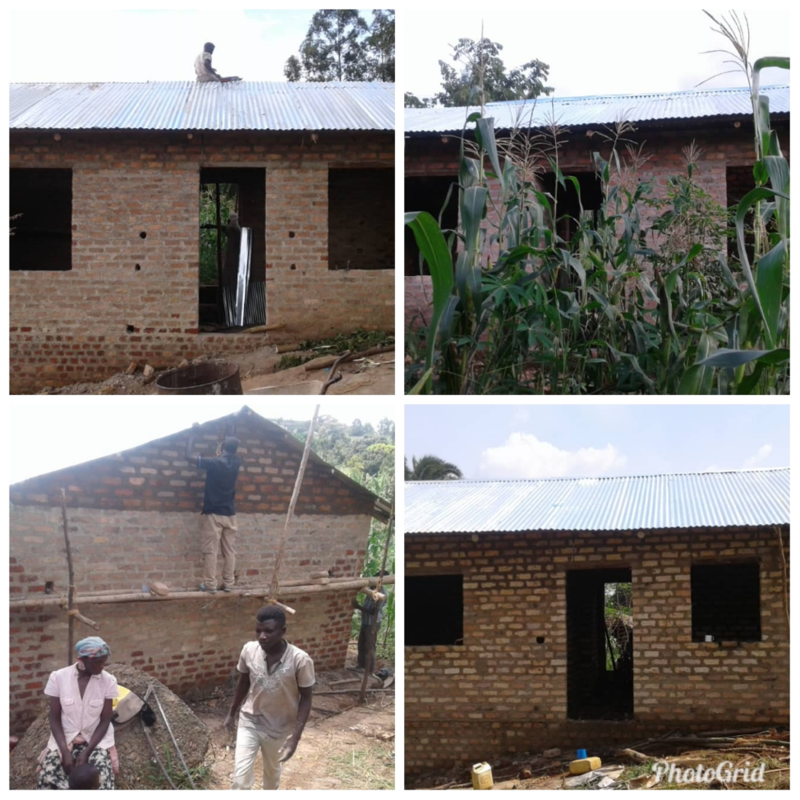 Our guardianship program (foster care) is really doing well and our target is to construct 5 houses for our children staying with guardians under this program. 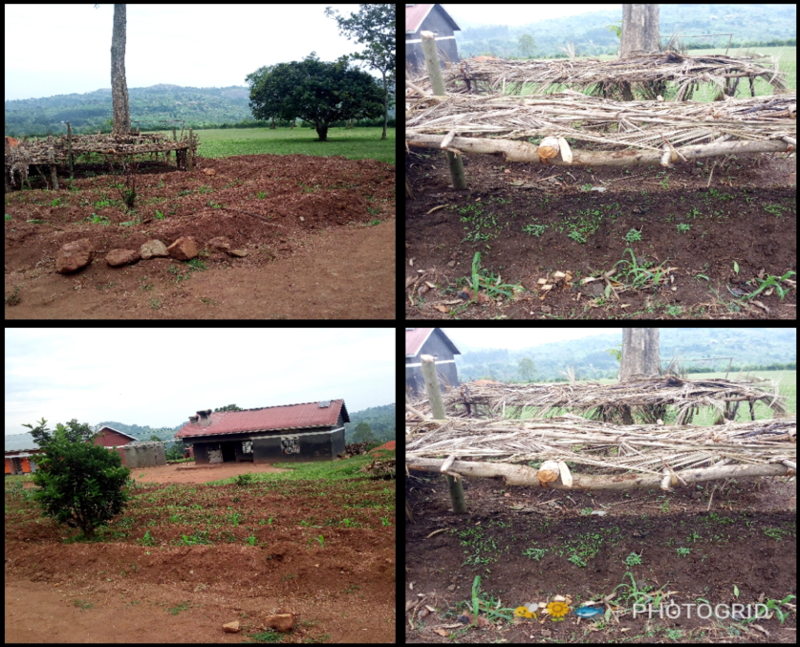 Before they we really sleeping badly, as you can see in the ‘before and after’ photo below. So far we have finished 4 houses out of 5. The children and the guardians are really happy. 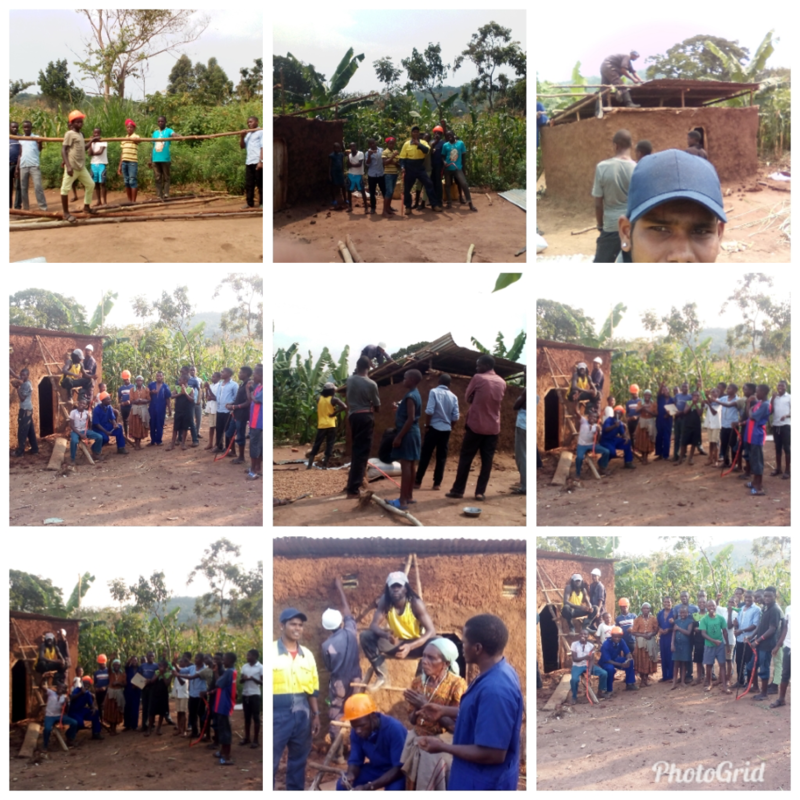 Our Children in the building class and carpentry class, with the help of the caregivers, Aman and Boaz, the horse trainers, decided to start a community service project to help people living around Miryante. 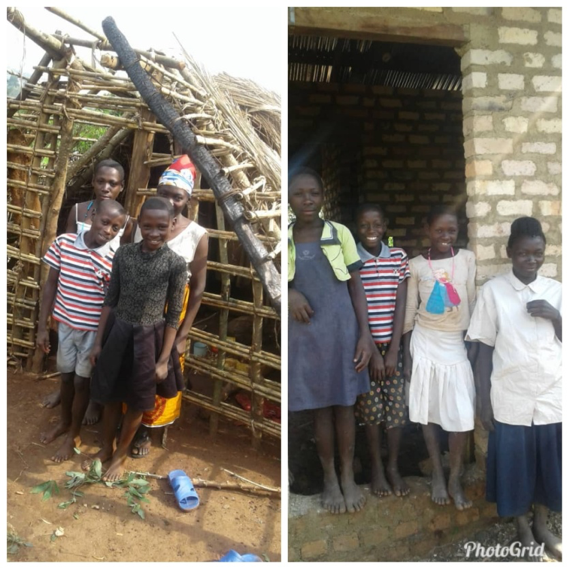 The children in Miryante who are studying carpentry and building were able to renovate the house for a very old lady in our neighborhood whose house had collapsed and had left her sleeping outside. We are glad that now we have the skills to help to make our community a better place. 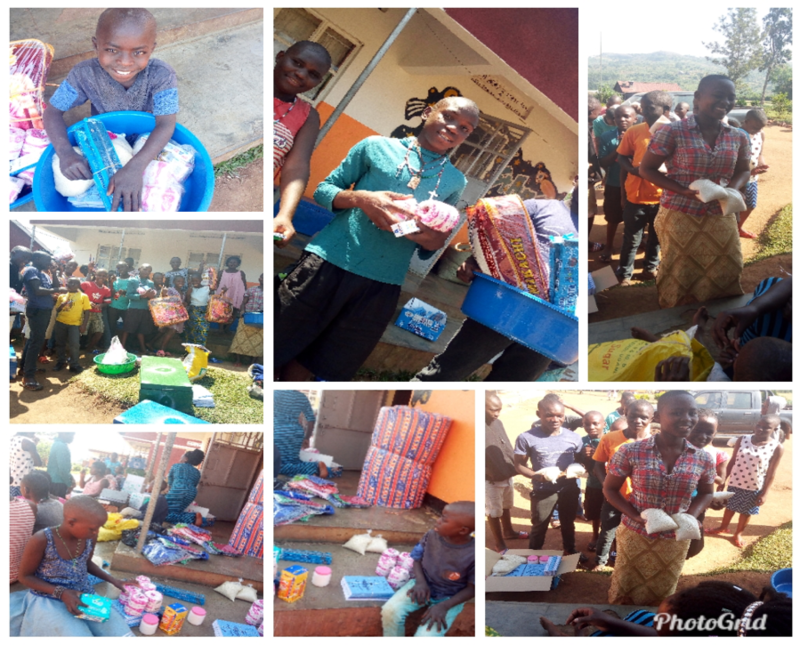 A very big thanks to everyone who has contributed towards Miryante Orphans’ Home’s well being to make this the best December ever. We love you all! Greetings from Miryante! All the children are of good health. Our candidates of all levels started exams from 6th to 16th of this month. 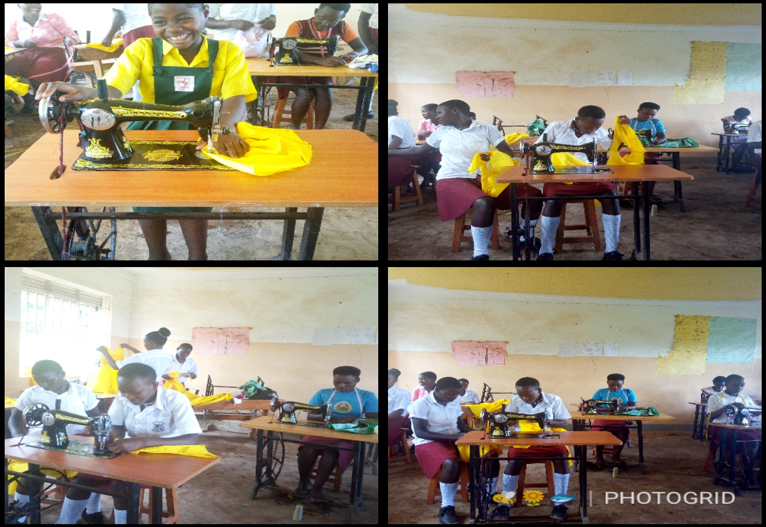 There were 3 children in Senior level four, and 13 children in Primary level seven, and 8 children taking exit exams at the technical school. 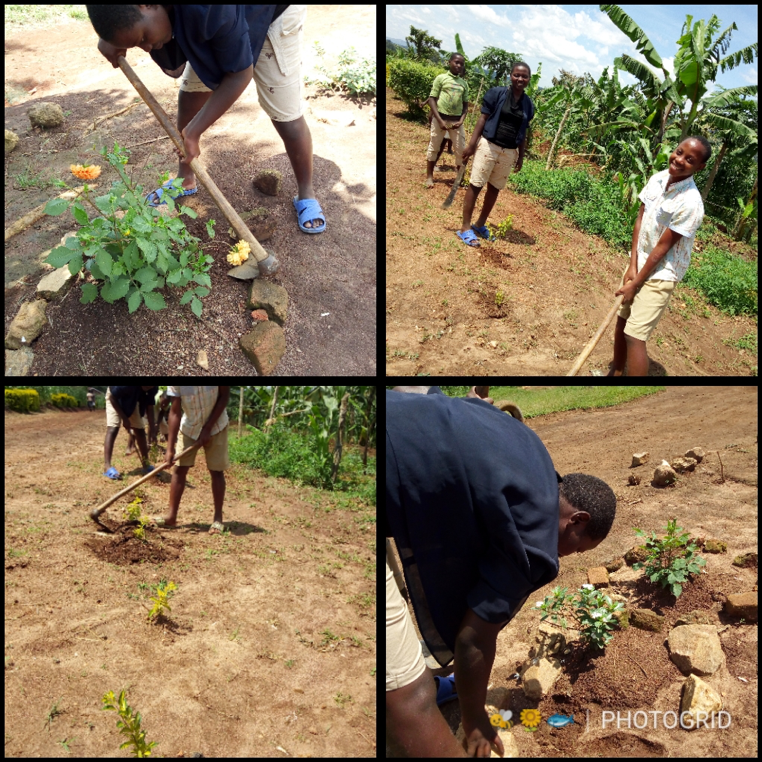 They are already enjoying holidays and planting flowers to make a natural fence which will beautify the home as part of their holiday work. 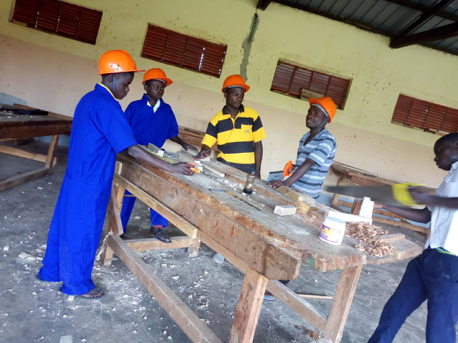 Below are 8 of our children from the orphanage doing their practical in UBTEB and DIT at Miryante Vocational School in order to finish their courses and other students are preparing for their end of year exams. 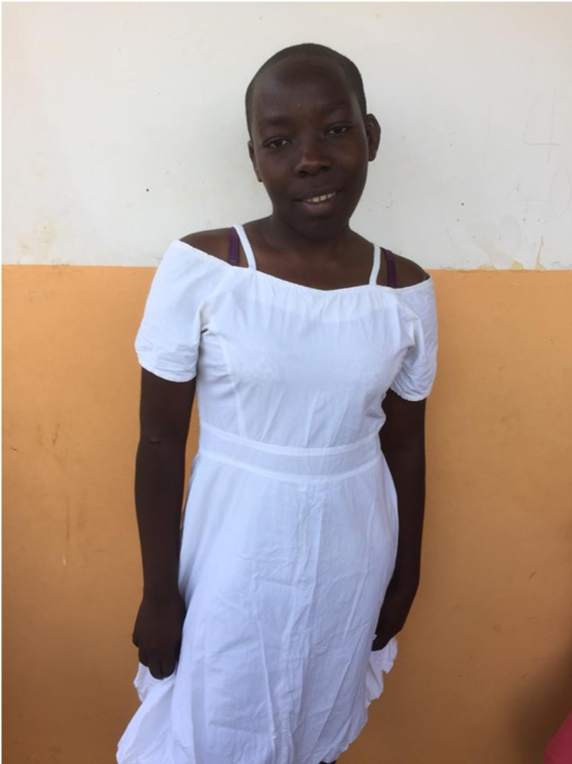 Below is Maria one of our own children preparing herself to start Tailoring practical class next year. This is the course of her choice and she can’t wait to join next year. 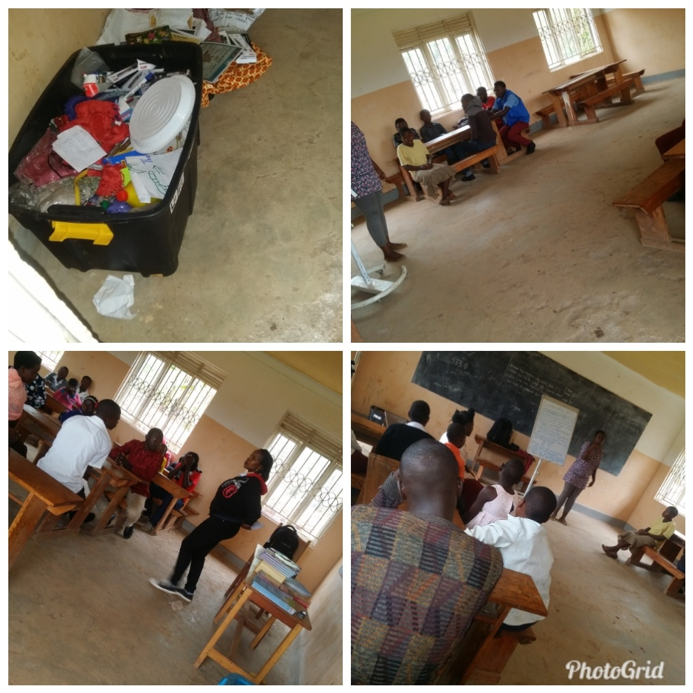 Debate club: We are so grateful for our social workers, our Peace Corps Volunteer Alex, our social workers and children that do take a lead in the debating class. This has helped a lot to our children to improve on their English due to the practice they make every Saturday in debate club. 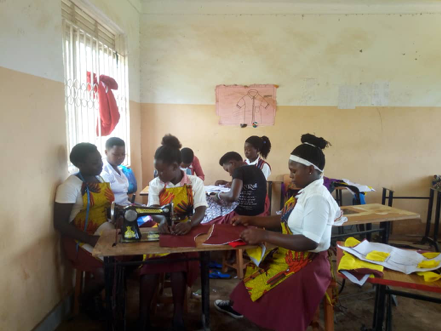 They also compete with the neighboring schools including the Miryante Technical school. The picture below showing the debate committee. Health club; This club was formed by Sunday Clovice, one of our kids in the orphanage, and was guided by the staff of Miryante to help the club to form a mission and vision. 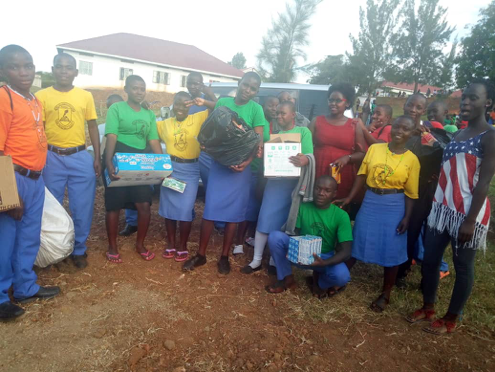 The staff members have also been supportive towards this club and have contributed much in improving and maintaining the general cleanliness of the orphanage. 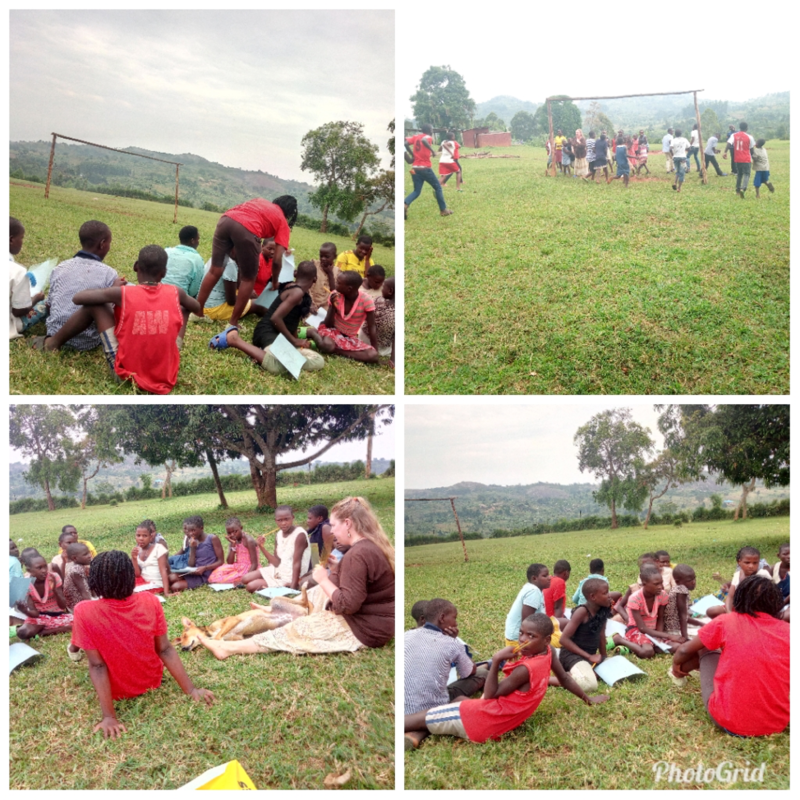 We are also grateful for our Peace Corps volunteer Alex who has been inviting other volunteers to educate the kids more about the meaning of health club and also to sensitize the children about diseases like malaria, typhoid, and cholera to create awareness in the community of Miryante. 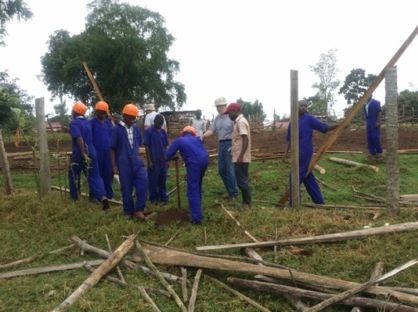 Construction of houses for children under guardianship program has begun. 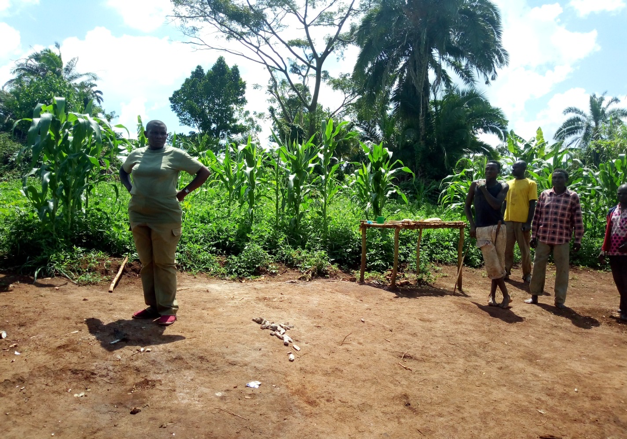 Margret, one of the guardians of four children who we found at the site is filled with joy about the construction. It was really very hard to convince her to take up these children and stay with them. 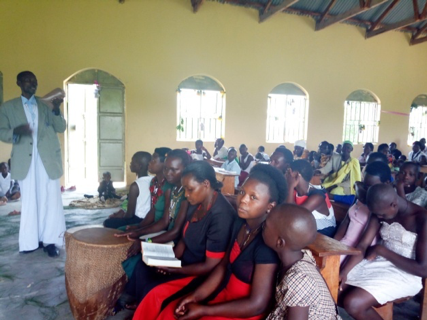 At first she disappeared and left the four children in the house but after serious counseling she took up the responsibility and she is now very happy with the support she is getting from Miryante. These include food, scholastics materials, clothes, medical care; this is provided monthly and visited weekly. Now, with the construction of the home, she is also being provided shelter. 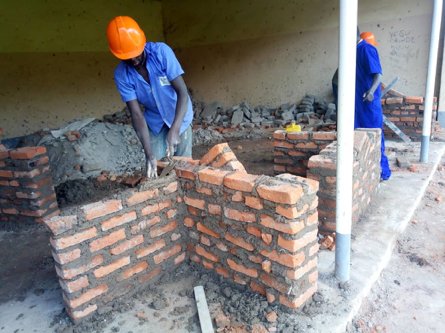 Below is pictured the construction site and donations to the children she is caring for. 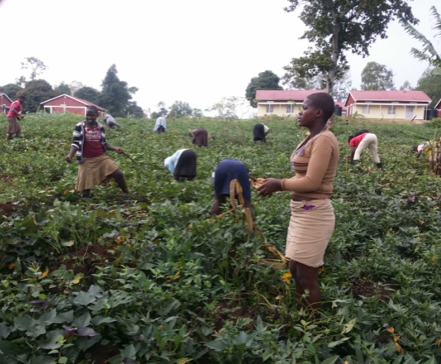 Agriculture: This month we are harvesting beans and vegetables (sukuma wiki). 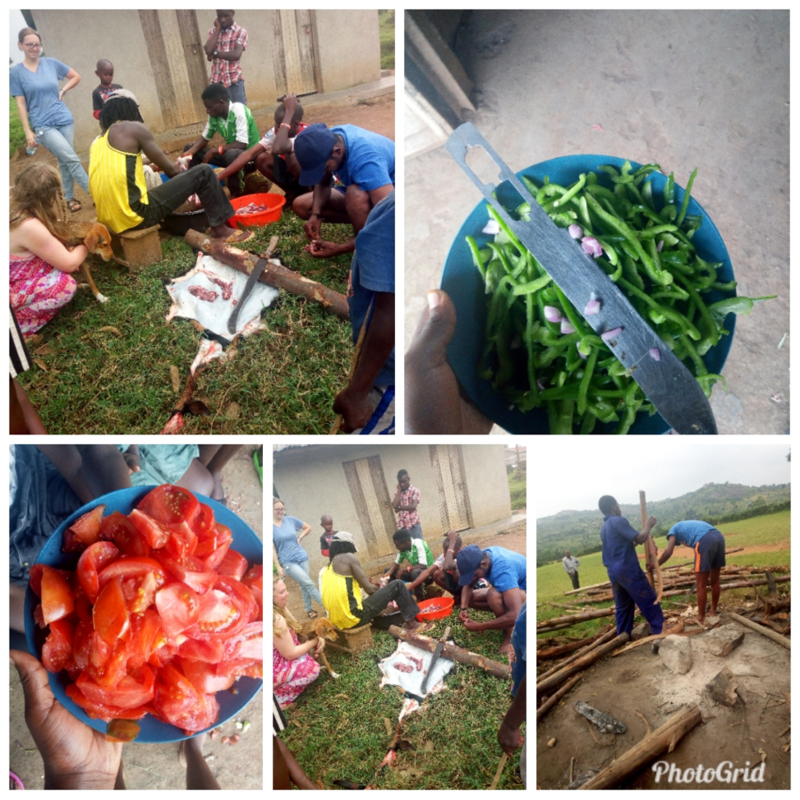 We are happy with the support from our Peace Corps volunteer, especially under the vegetable program to support the diet of the children. We are now harvesting vegetables in plenty. Our animals: are adding in numbers as shown below. 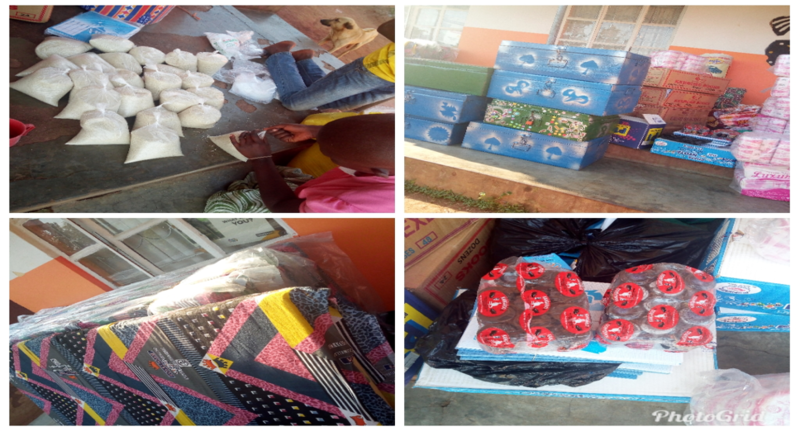 We are really grateful and humbled by everyone’s contributions towards Miryante orphanage and school. God Bless you greatly! This month was the month for parent teacher conferences. 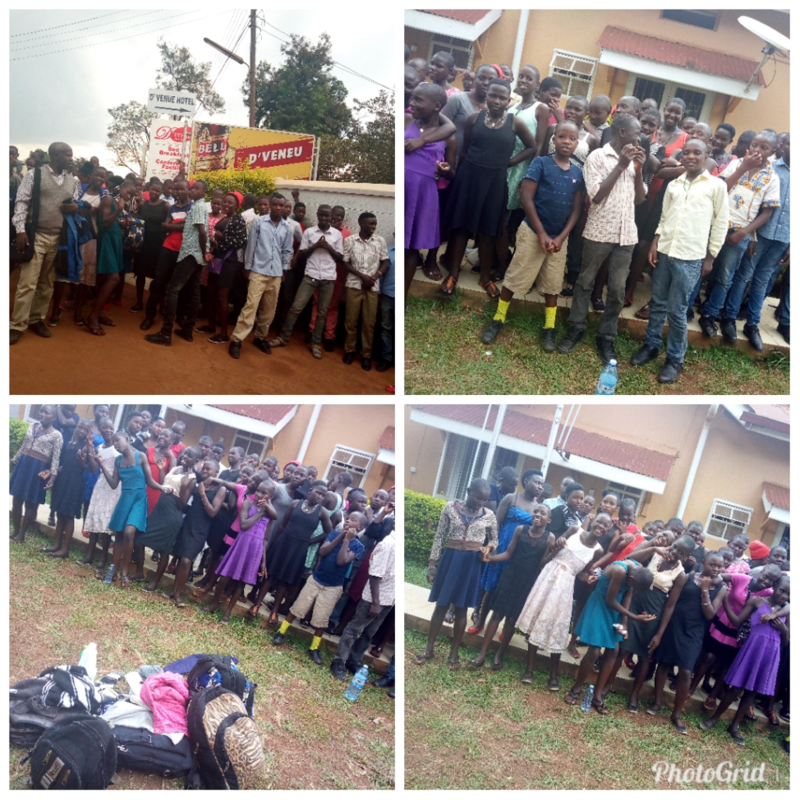 We managed to visit our children within this month in their different schools to see their education progress and clear the school dues for remedial lessons to improve on their performance in class as we prepare the candidates for final exams. 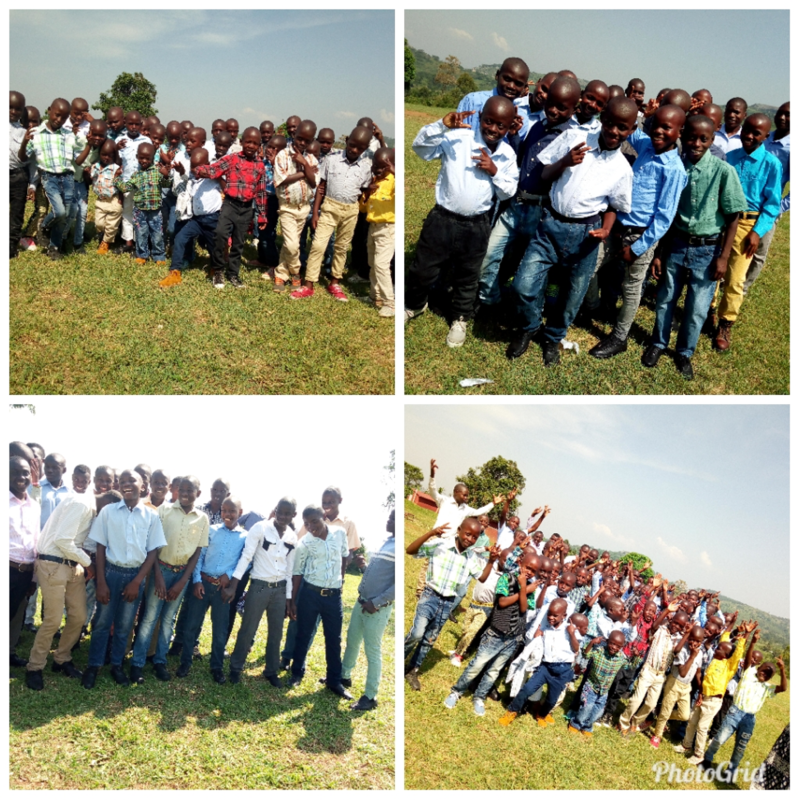 We also managed to attend the visitation day at King Solomon College- Kyatega and St. Tomas Junior School and all our children were happy and doing well in School. 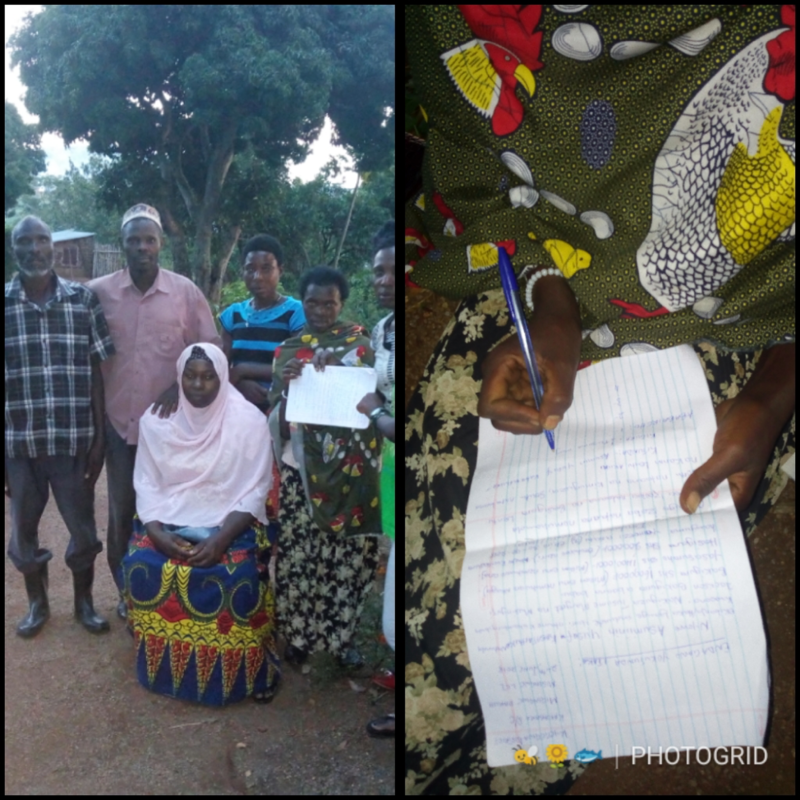 In this month ,we carried out baseline surveys of new households that will be added to the guardianship program at the end of this year. 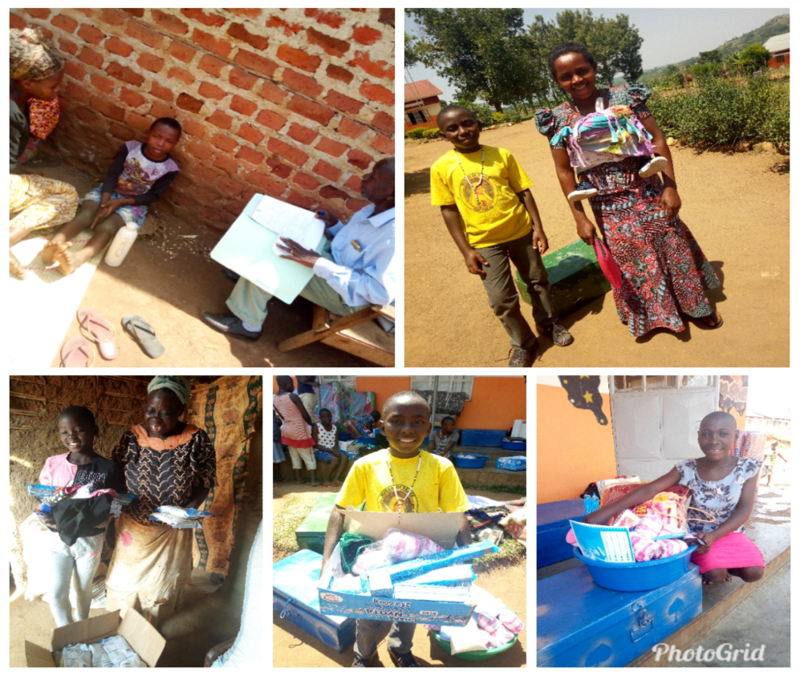 This means that we are trying to find relatives or well wishers in the community so that some of the children in the Miryante Orphans Home can transfer to lives with families and receive in-kind support. We want to transition to a foster-care model as much as possible. This survey covered six households from four sub counties i.e. ; Mpara, Kakabara, Hapuuyo and Kihuura. 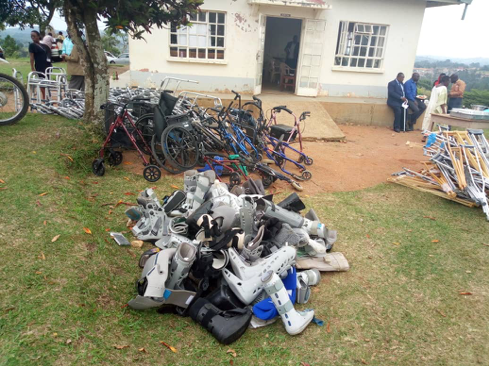 We found that two households were not fit for the program because the guardians were too old and couldn’t manage to support the grandchildren and in another home the guardian had issues with substance abuse. The Objectives of the baseline survey was to find out the information about the potential guardians of these children, to know about the hygiene and sanitation of the households, to find out the financial status of the guardians and to find out the character of the guardians both negative and positive. 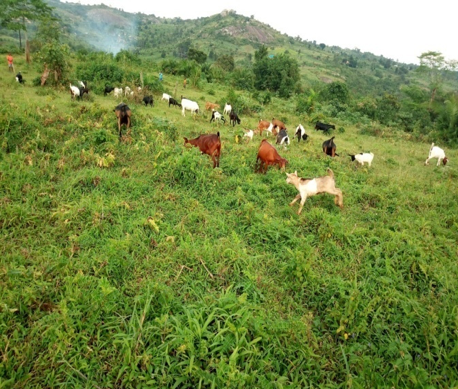 This month we managed to save land for three of our children from Hapoyu sub-county. 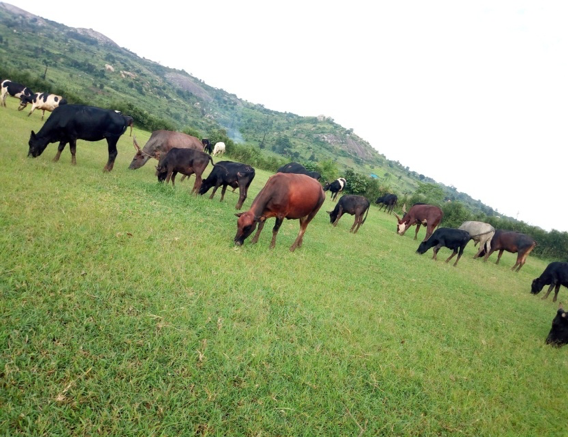 This has been a big problem where an elder brother wanted to sell off the land without considering the sister under our care. 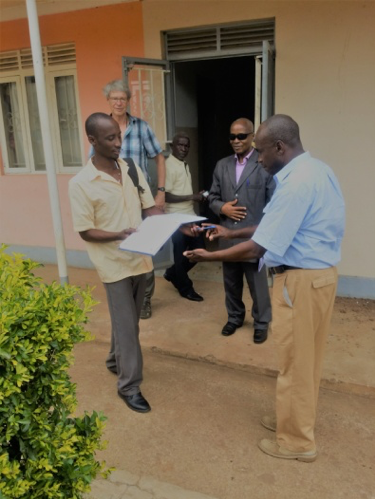 We had to get in touch with chairperson LCI and the police so that brother was stopped from selling the land. 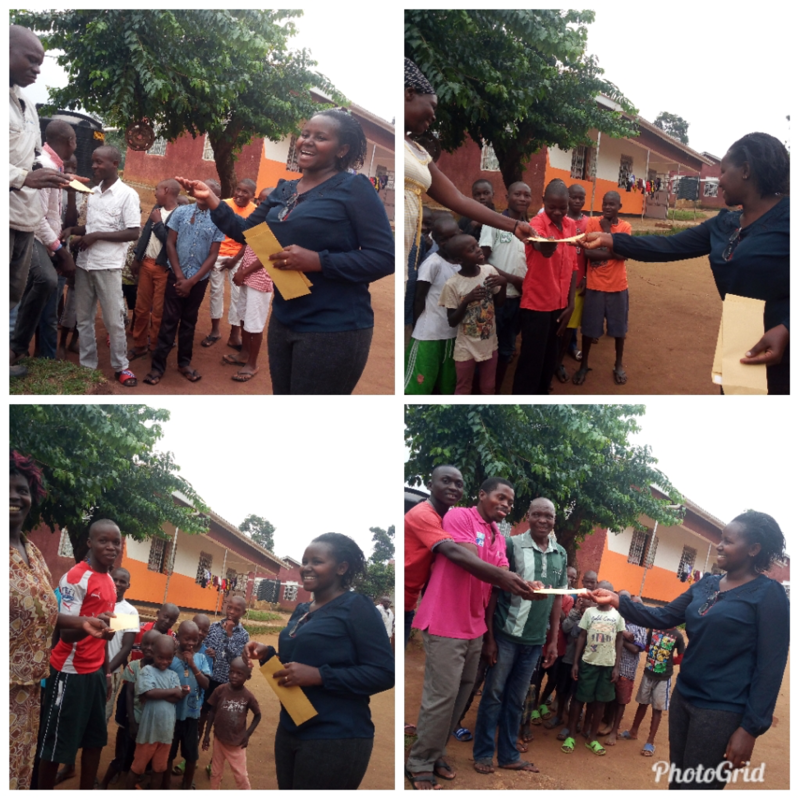 We have also advised households to register their property with the LCI chairperson in order to get land titles and proper documents as shown in the pictures below. This is part of the advocacy work we do for our orphans to protect their rights. 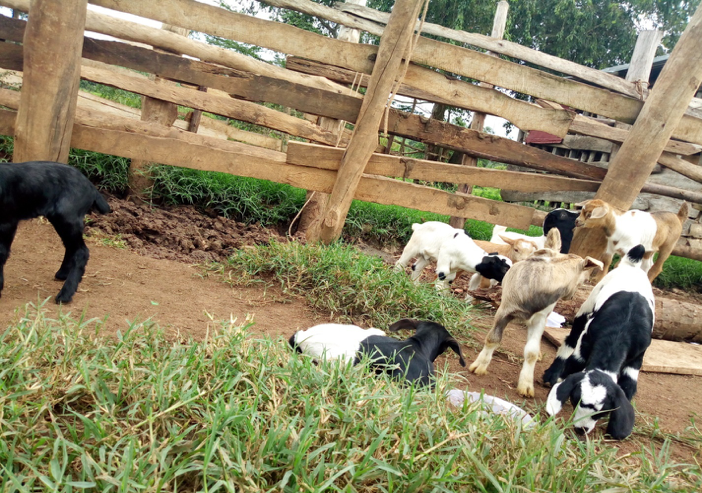 One household which had not caught up with agriculture activities is now doing well. Currently all our households under the guardianship program are doing well. 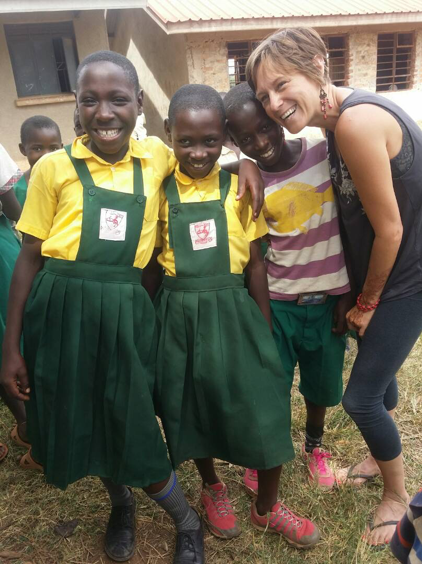 Next month our Peace Corps volunteer, Alex Rauch, is going to join the program to teach guardians about perma-gardening. 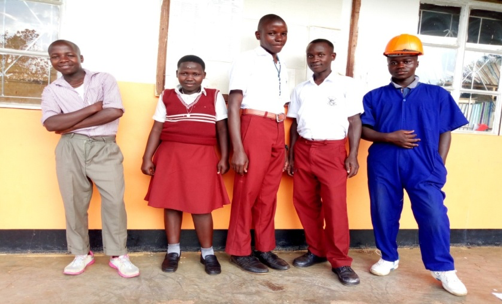 Children under guardianship program in their new school uniforms. This month Cathy and Terry Dresbach visited us all the way from the United States. These are Laura’s family friends. We were grateful as a community for the wonderful love that the family shared with us. The gardens are doing well especially during this rainy season. We planted beans, carrots, pumpkins, eggplants. Our volunteers are doing a great job. 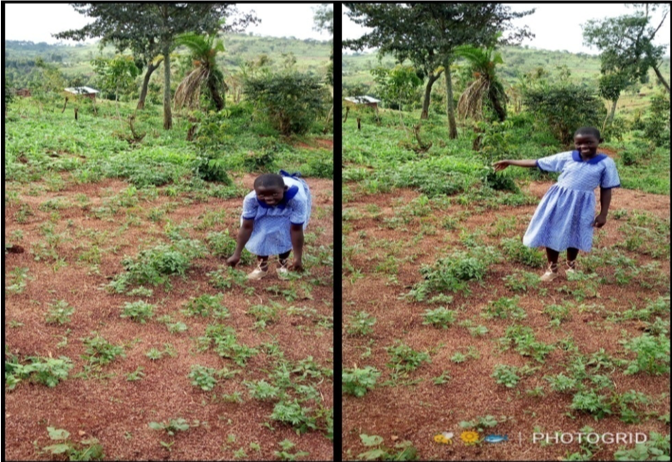 Alex our Peace Corps Volunteer planted crops with children. 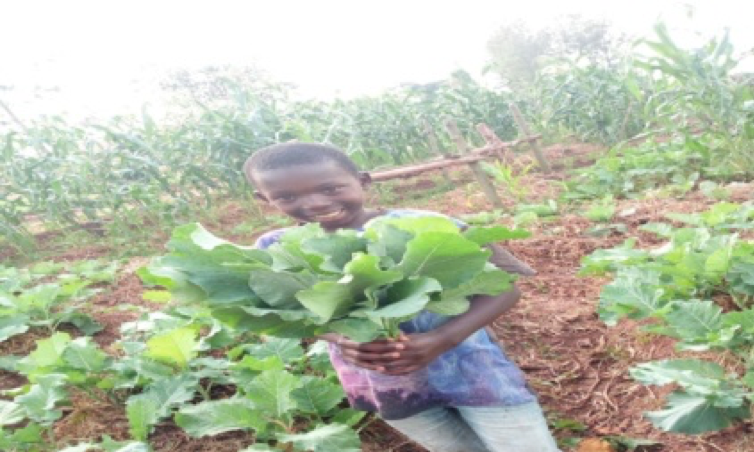 Some children planted maize in their small gardens which is growing. 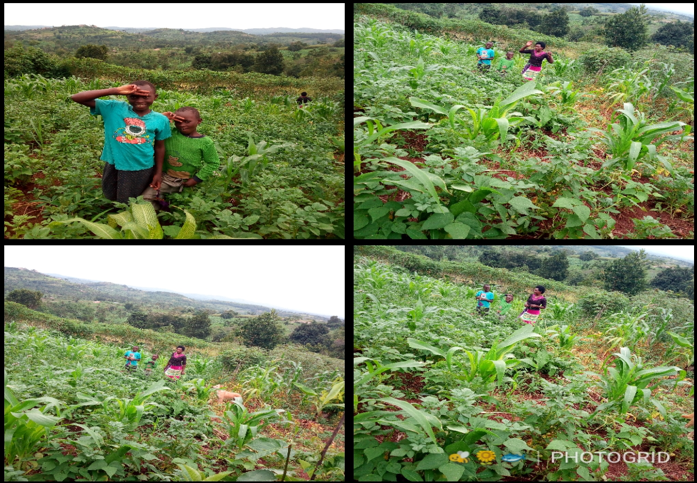 We are harvesting some crops including bananas, sweet potatoes and cassava. 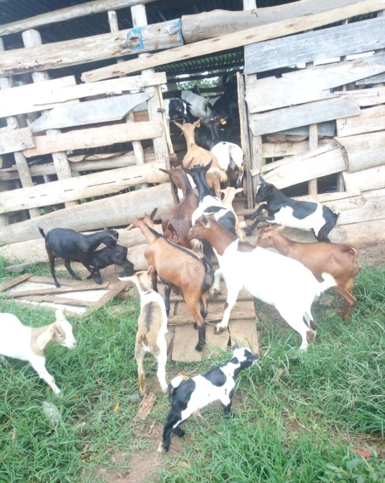 The goats gave birth this month. We managed to complete the renovation of the house for the herdsmen. 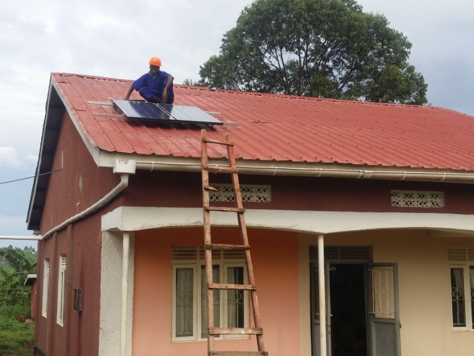 Technical school: We are so grateful for Root Cause Uganda for the solar panel donation given to our school. 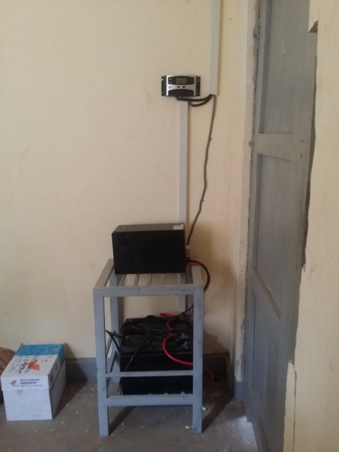 We can now type and print documents at Miryante Vocational School because of the strong solar panel installed. God bless each of you all abundantly! 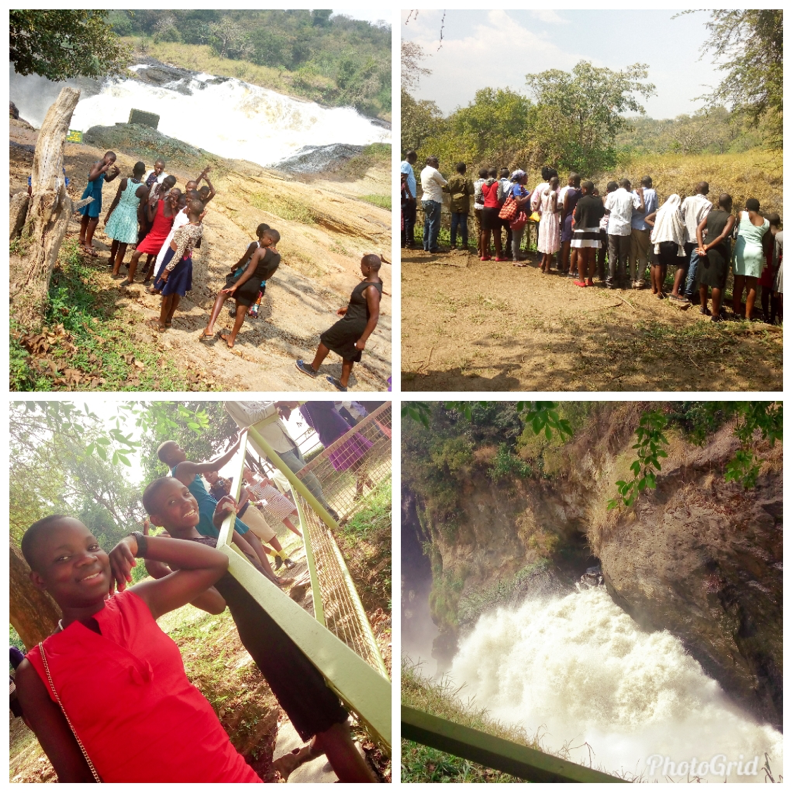 We recently lost one of our children Kasiime Fiona Amooti. Kasiime Fiona Amooti was born in April 15, 1999. She was born in Ibonde village in Kabarole District. Her mother died when she was two and a half years (2yrs 6months) and the mother did not tell them about her father. She started staying with her maternal aunt who was married in Moyo District. When she was in senior two her aunt was no longer able to take care of her and she was forced her to join Miryante Orphanage. 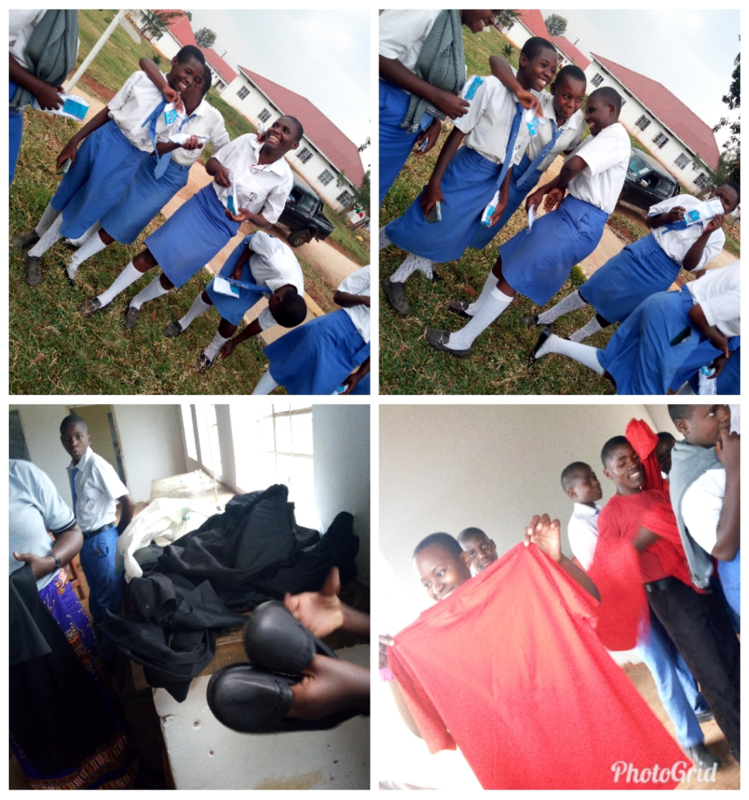 When Fiona passed away She was in senior Five at King Solomon College-Kyatega. Fiona was interested in football. She came to Miryante on May 14, 2015. She loved to debate and she was in the Miryante debating club. She wanted to become a Nurse in the future but unfortunately her dream did not come true. In November 2017, Fiona suffered from skin rush which started from her ears and later spread all over the body. She was treated from Miryante clinic which referred her to Kyegegwa Health Center IV and her all tests showed negative results which confused the doctors who referred her to Mubende Health Unit and they also found out that her conditions were beyond their understanding which forced them to refer her to Buhinga Referral Regional Hospital in Fortal Portal where she was admitted for some time. 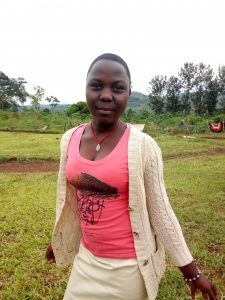 While in Buhinga Referral Regional Hospital, Fiona started complaining of stomach pain and started vomiting blood which scared the doctors and they made for her a referral to Mulago Hospital in Kampala. 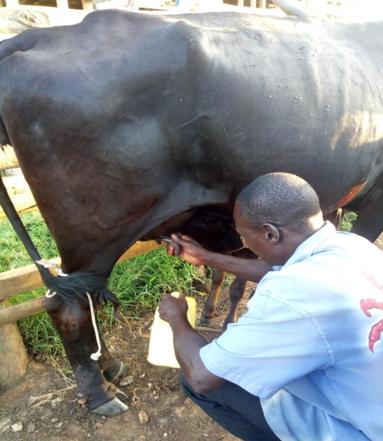 While at Mulago, Makerere Research Students discovered that Fiona had a weak immune system which could not fight bacteria from reaching her body. This resulted into the bacteria to fight with other foreign bodies that resulted into skin rush. She started getting medication and her condition improved. Because the aunt was staying in Moyo District she went with her because she needed serious attention. 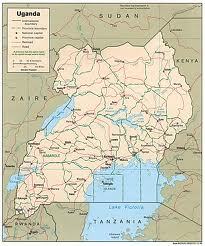 While in Moyo District there was a great improvement. 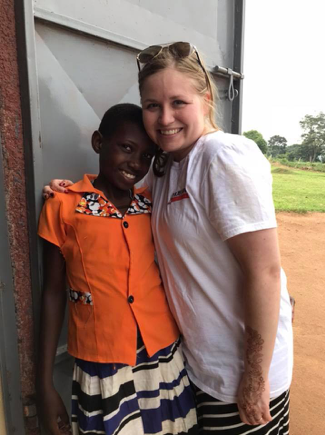 Early September this year Fiona’s conditioned worsened, she was taken to Moyo Hospital where she spent two weeks and unfortunately on 18th September 2018 we lost her life. 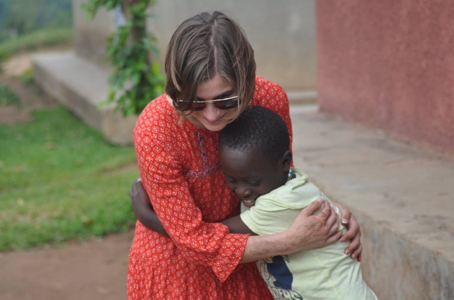 Unfortunately Fiona was born alone in her mothers’ womb and she was only survived with her aunts and her grandmother. Fiona was well-loved and we miss her terribly, but we know that she is with God. Please join us in prayer for friends and the family who are missing her. 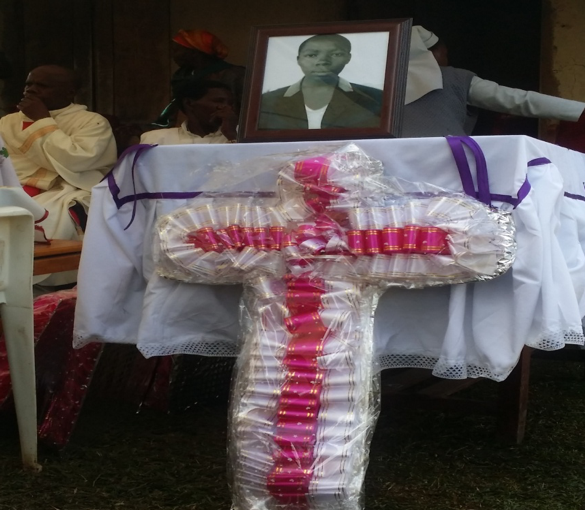 A Picture showing Kasiime’s burial RIP. Please keep us in your prayers during this difficult time. 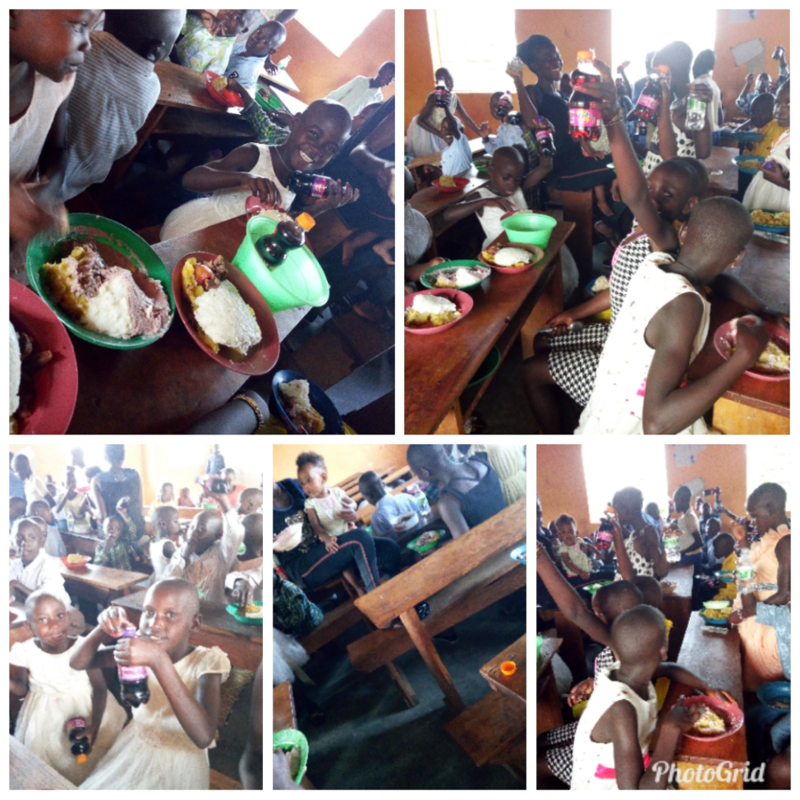 Under this program, we have manna packed rice which is food containing all nutrients like carbohydrates, proteins, vitamins and all minerals. 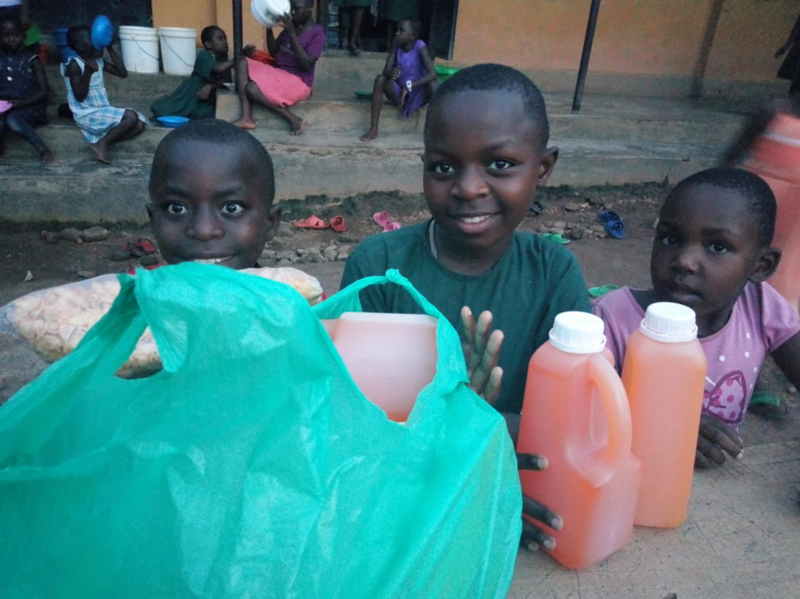 It has helped our children in the orphanage to receive a proper and balanced diet when they are sick. 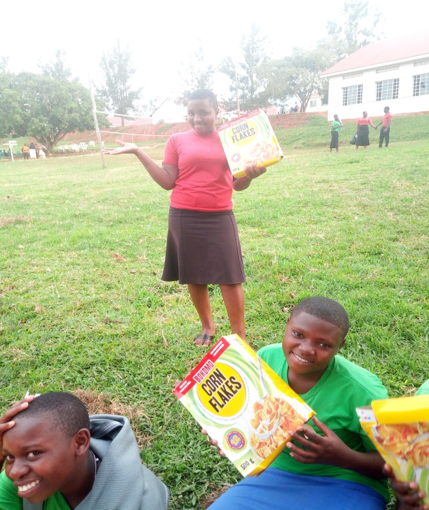 Manna pack rice has become a complete meal which is taken by the malnourished children during lunch or supper and the children prefer Manna Pack to other types of foods. At first some children were not enjoying it but now they all eat it. 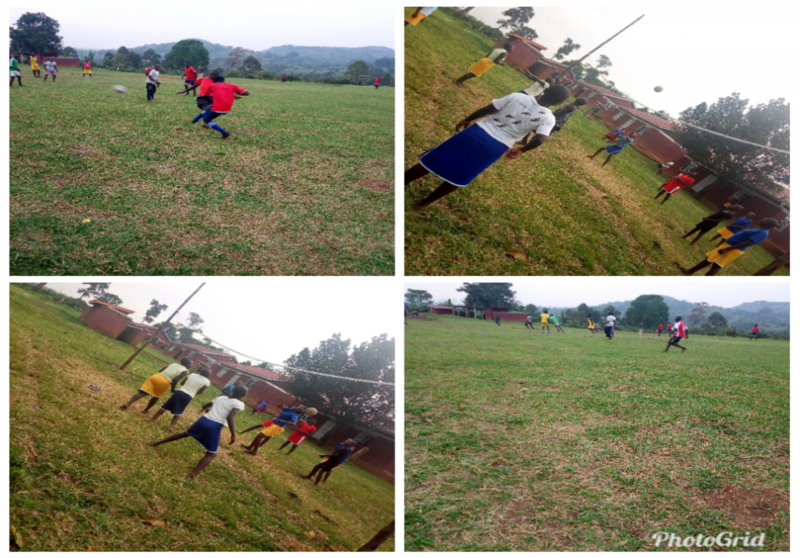 It has improved on the children’s health because most of the children no longer fall sick and they are energetic. 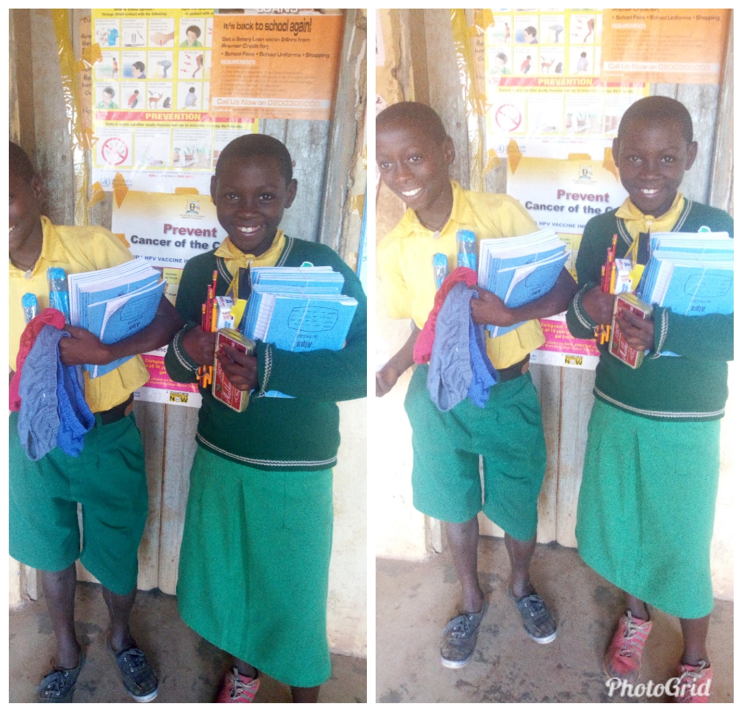 According to our nurse Twinomugisa Judith’s monthly report, there has been a great improvement on the children’s health thanks to the manna packs according to her examination. It shows that the signs of looking weak, bony, dry skin and hair and occasional sickness have disappeared. 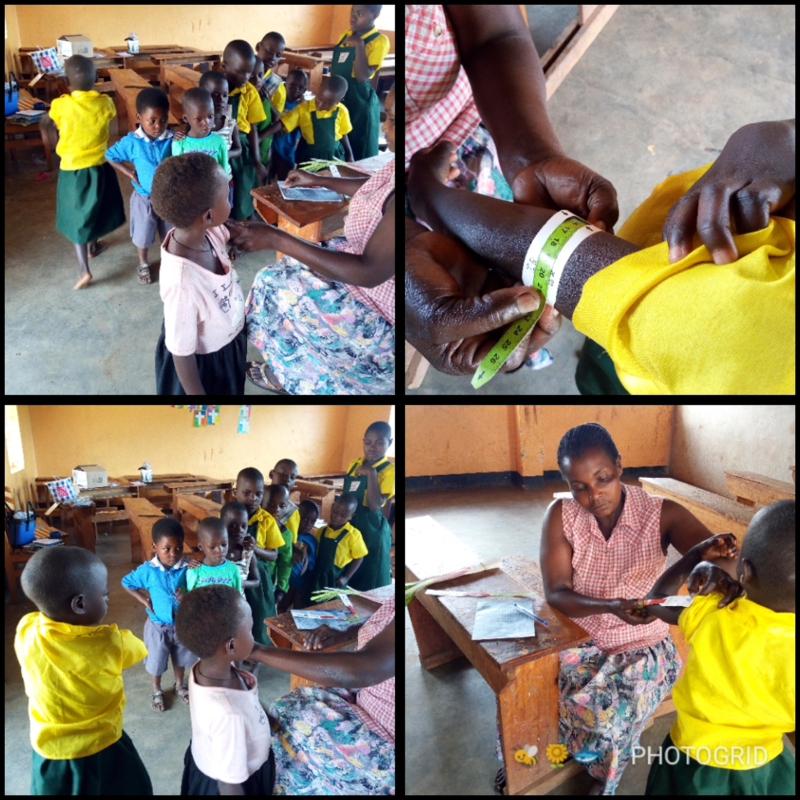 According to MUAC (Measurement of Upper Arm Circumference) measurements, all our children are in green (they are growing healthy). School open on 17th of Sept 2018, all of our children are in school as shown below. 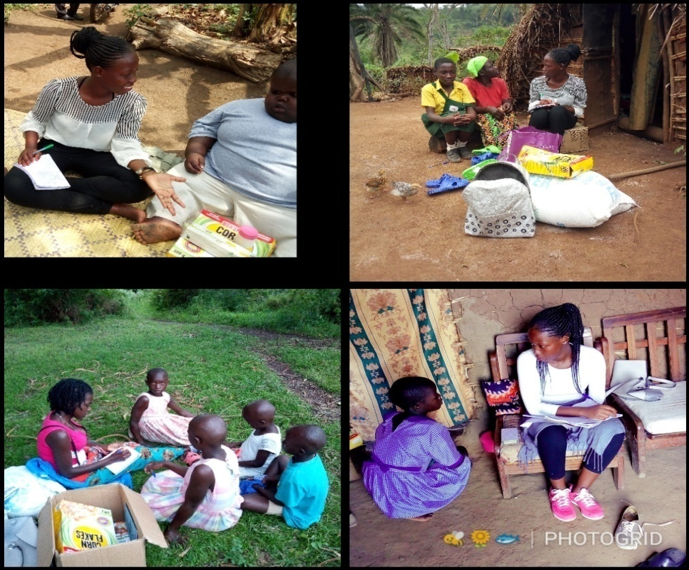 Under this program we have five households which the organization started within this year. 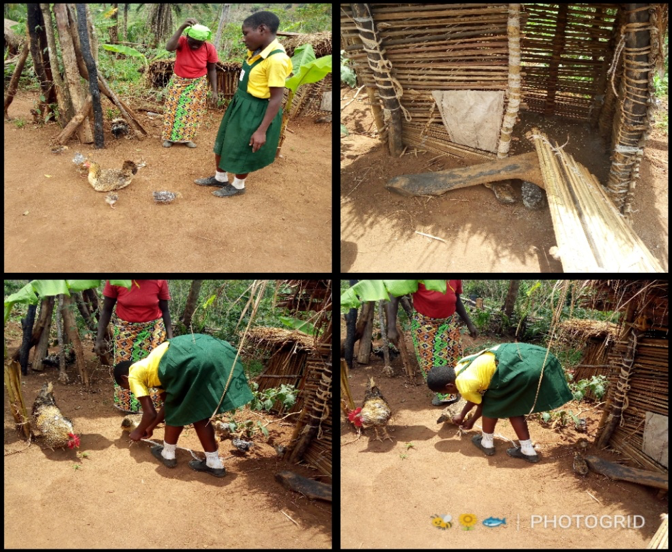 When we visit these households our main aim is to check the sanitation and hygiene, performance of the children in school, health and their wellbeing and to know how the guardians have managed to cope up with the continuing program. 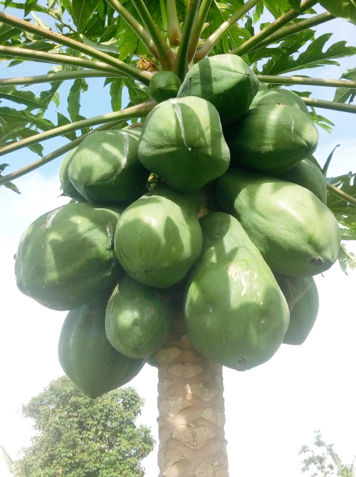 Agriculture: There is a great improvement in agricultural activities because all the households have engaged themselves in planting food crops like cassava, beans, banana , Irish potatoes , sweet potatoes , groundnuts, maize, pumpkins among others, in order to supplement on what the organization is providing and also to improve on the balanced diet of their children. 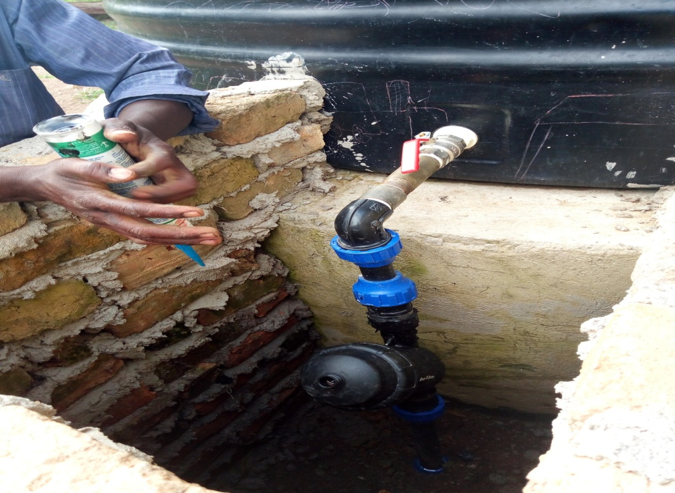 Sanitation and hygiene: Basing on observation sanitation and hygiene has totally improved. Health: According to our observation, we found out that Isaac had started walking and had reduced weight basing on his physical appearance. This reduced the burden on the side of the mother because she used to carry him all the time but now his able to move by himself. 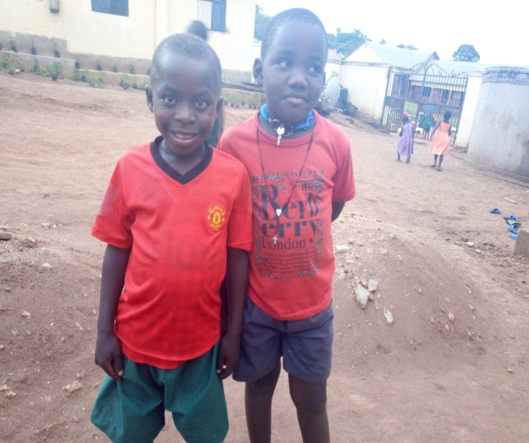 Education: children were supplied with scholastic materials and have reported back to school for third term part from Isaac is still at home but we are trying to get him a school near their home where he can be walking every morning this will start with next term. 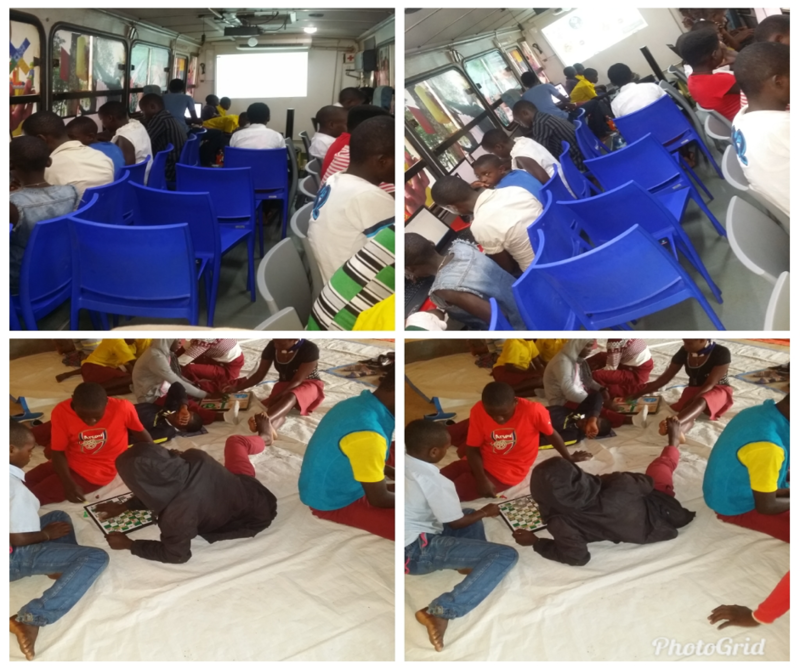 Pictures showing the guardians of the children under guardianship program. 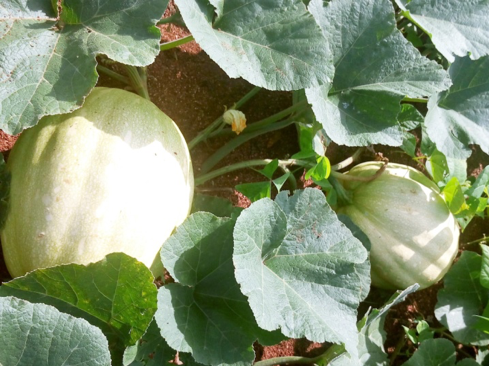 This is an agricultural activity majorly specialized on planting vegetables such as kale, green pepper, egg-plant, tomatoes and onions which are still in nursery bed for this season. It is also called kitchen gardens, which help to maintain vegetables /greens in the home from season to season. 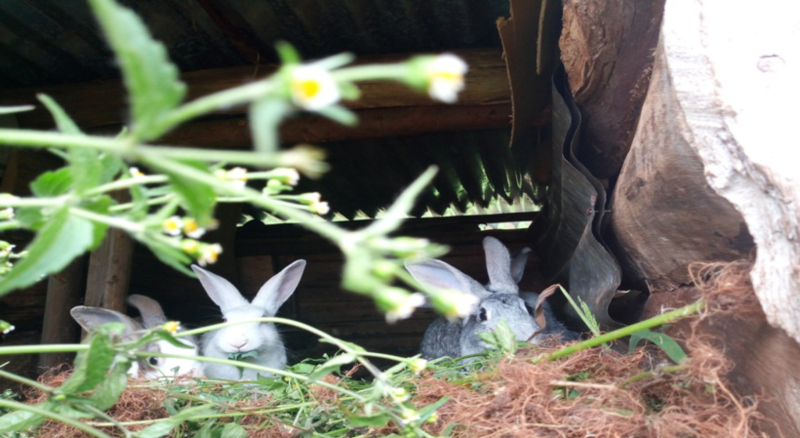 There are small gardens owned by each dormitory which can be manageable. During the dry season, the gardens have to be sprayed with water. 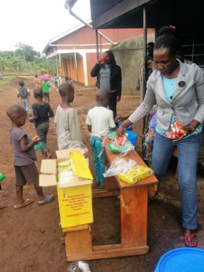 It has reduced on expenses of buying vegetables for the children. Children enjoy the greens and they are healthy. 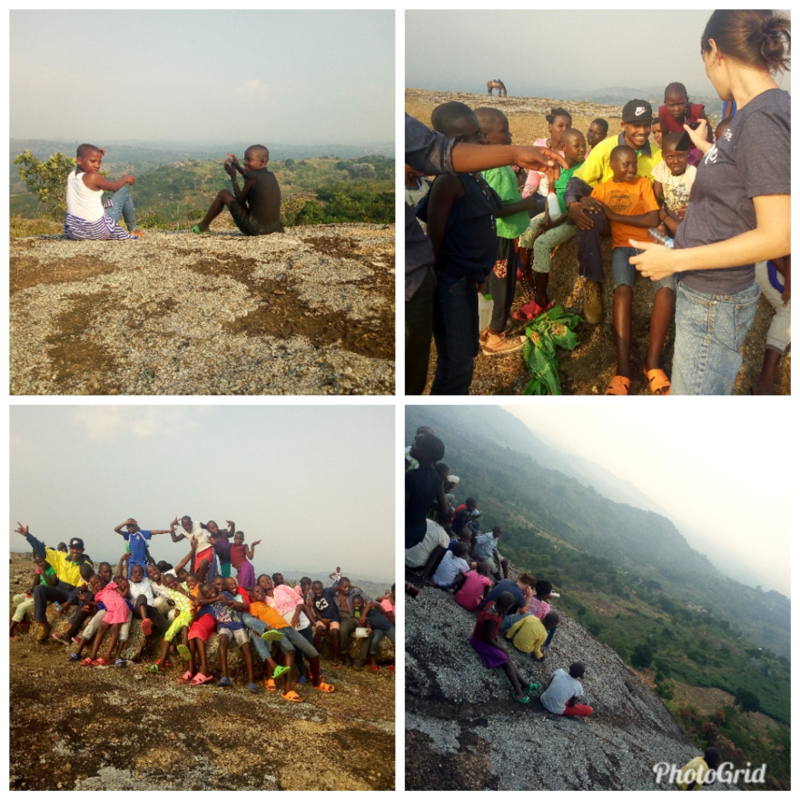 This program in Miryante was brought in by Madam Alex Rausch the Peace Corps Volunteer. Pictures of showing perma gardens and Nursery beds. 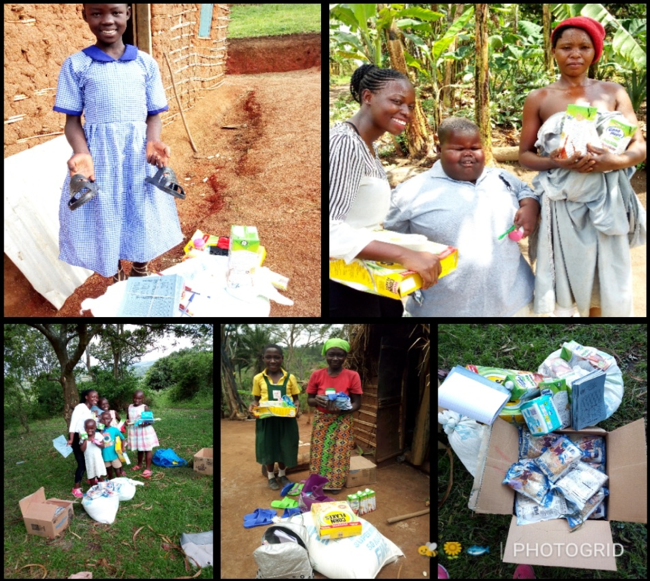 Last month we received a number of donations from different groups. 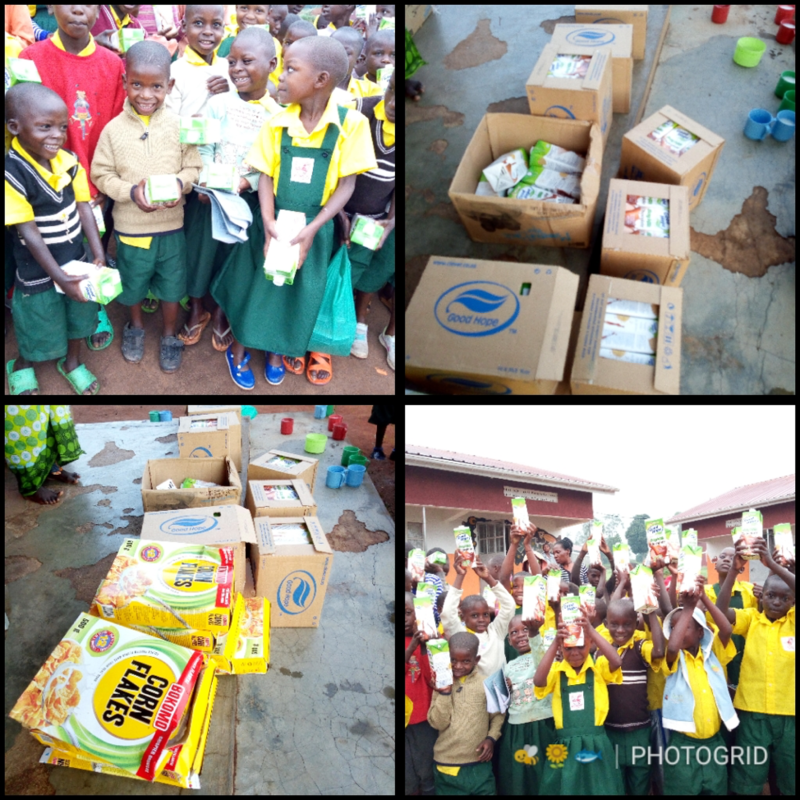 Below are pictures of children holding boxes of milk 476PCS and corn flakes 122PCS. 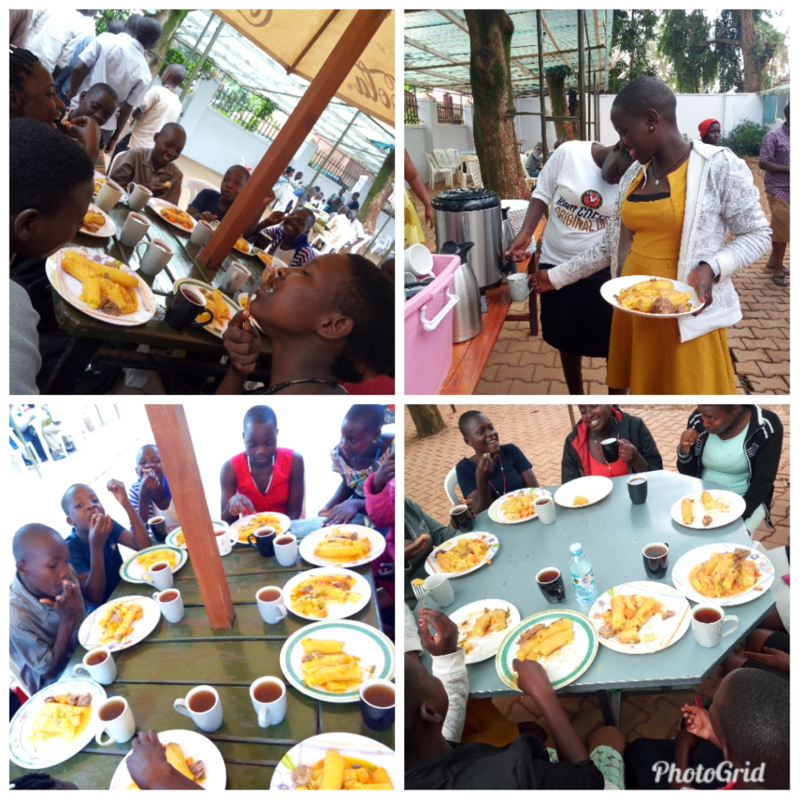 We are able to feed 120 children for two days and for corn flakes we are still feeding the children for another week. 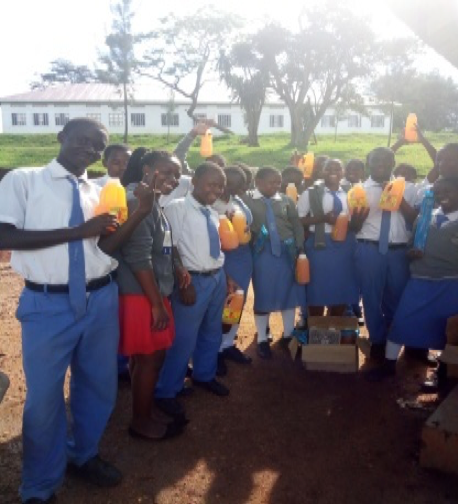 We would like to say thank you to the Patel family, Laura’s friends and Loe Traders East Africa LTD for this wonderful donation. 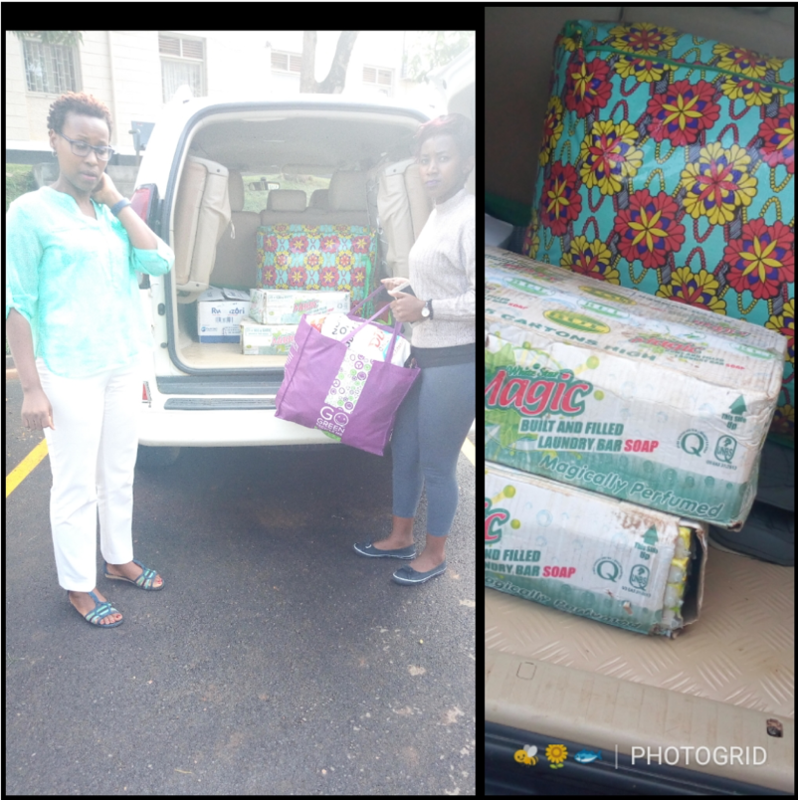 Another donation was from Dr. Gloria Kimuli Serwagi, a lecturer from Makerere university who donated two big boxes of star magic soap, shoes and clothes for the kids. We are really grateful for the love shared with us. 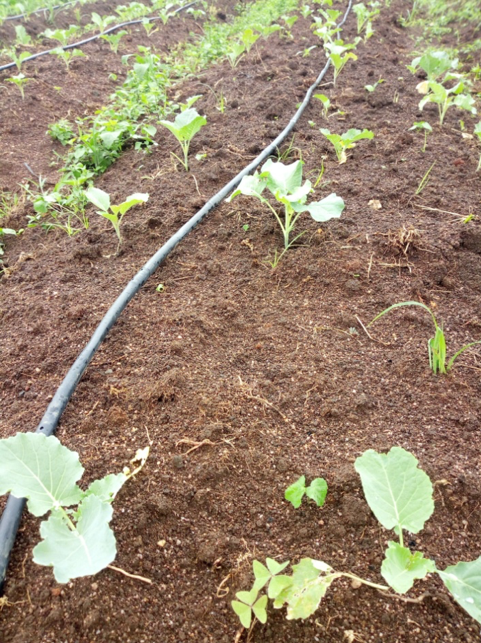 We are also grateful for the the drip irrigation that was donated by Fr. David Baumgartner and a top up from St. Peter’s Church. This is to help us with the vegetable garden such that we are able to run throughout the season. 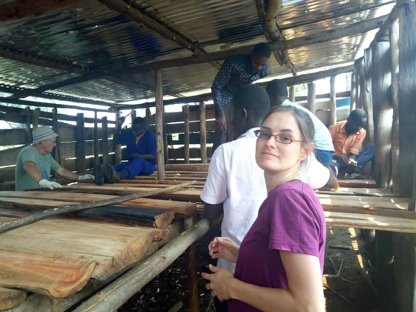 Alex Rausch our volunteer, Kato the caregiver have played a big role in the supervision of this project and also the planting of the vegetable garden. 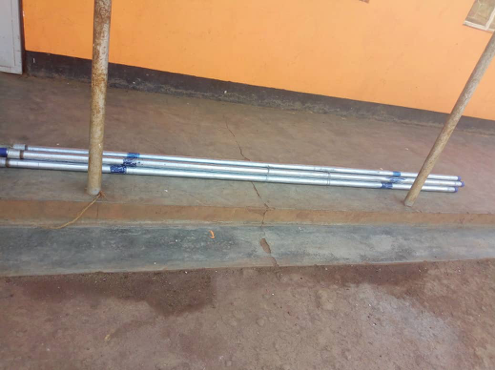 We are so grateful for the donation of solar panels and the battery for the school administration. 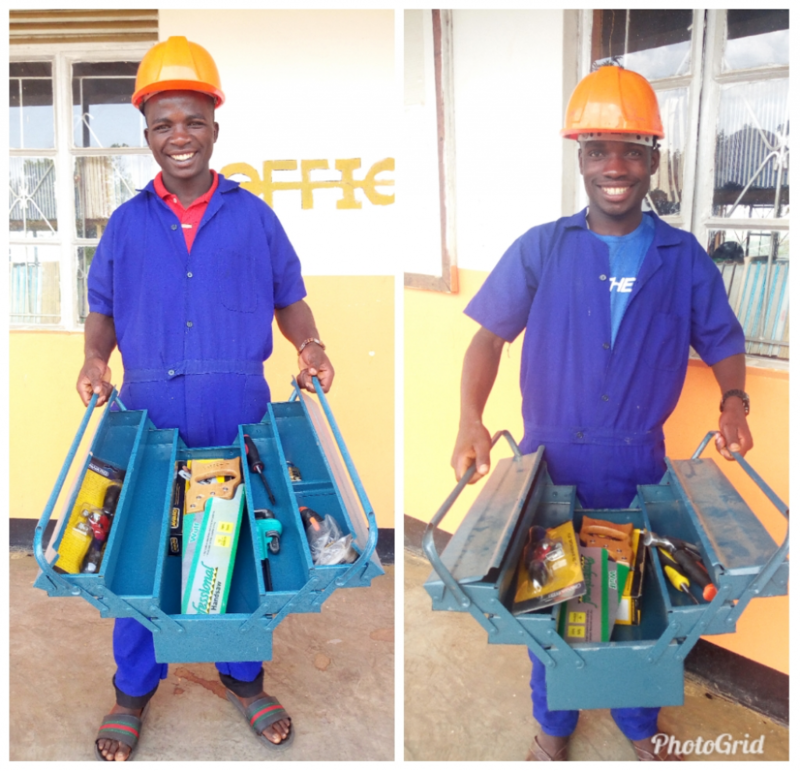 We can now print and photocopy at the technical school and this will help us save some money that we have been spending on fuel for the generator. Report from the counselor indicates that children’s’ behavior has greatly improved because she no longer handles cases concerning bad behaviors like stealing from the neighbors, escaping from the dormitories /home , abusing care takers and their fellow children, fight among themselves , amongst other characters, etc. 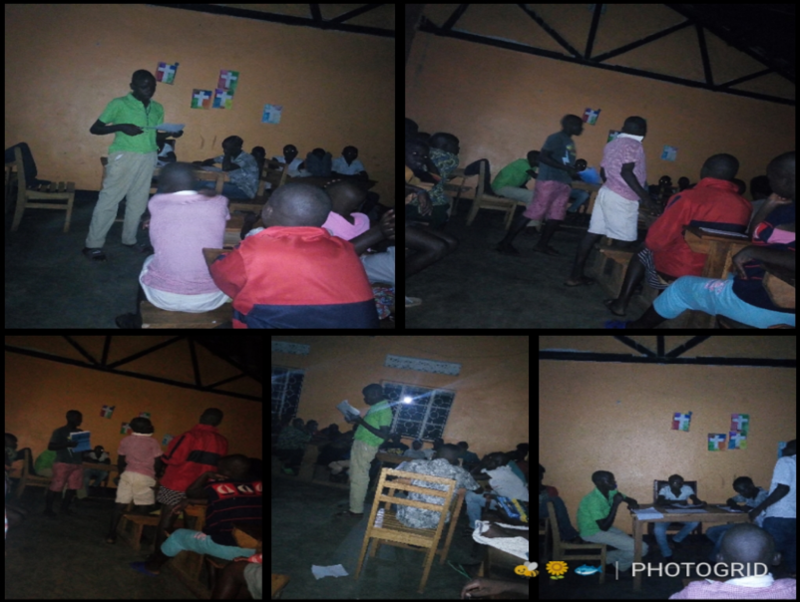 It also indicates that the children are able to interact /seek help from the counselor through sharing their problems they are facing and she gives them immediate help/ support all the time. There has been also a great improvement in academics of the children because the counselor has been in a position to share with the children and guide them on what to do for better grades. 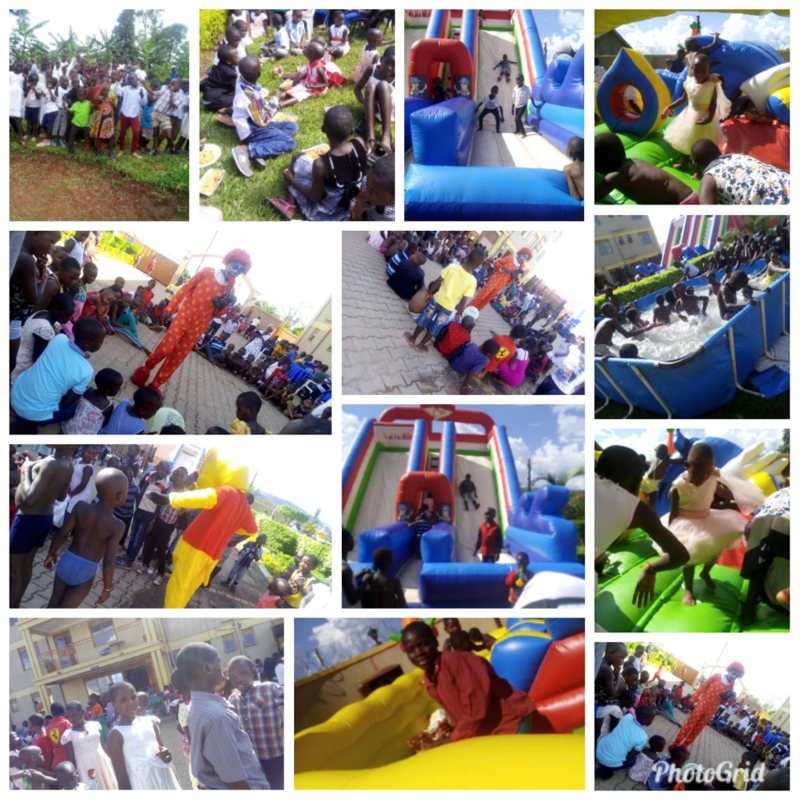 August has been a blessed month to us at Miryante Village. 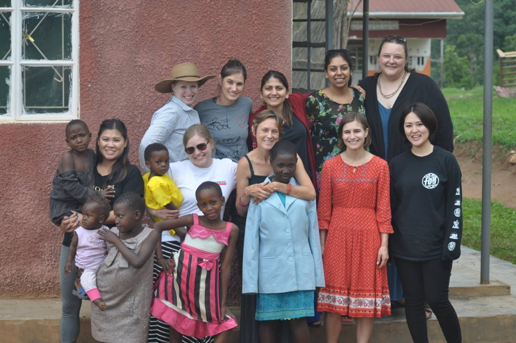 We received more visitors, some were Laura’s’ sisters, cousins and friends from the United States, India, Japan and Australia. We are really grateful as a community for the wonderful love that people do share with us. 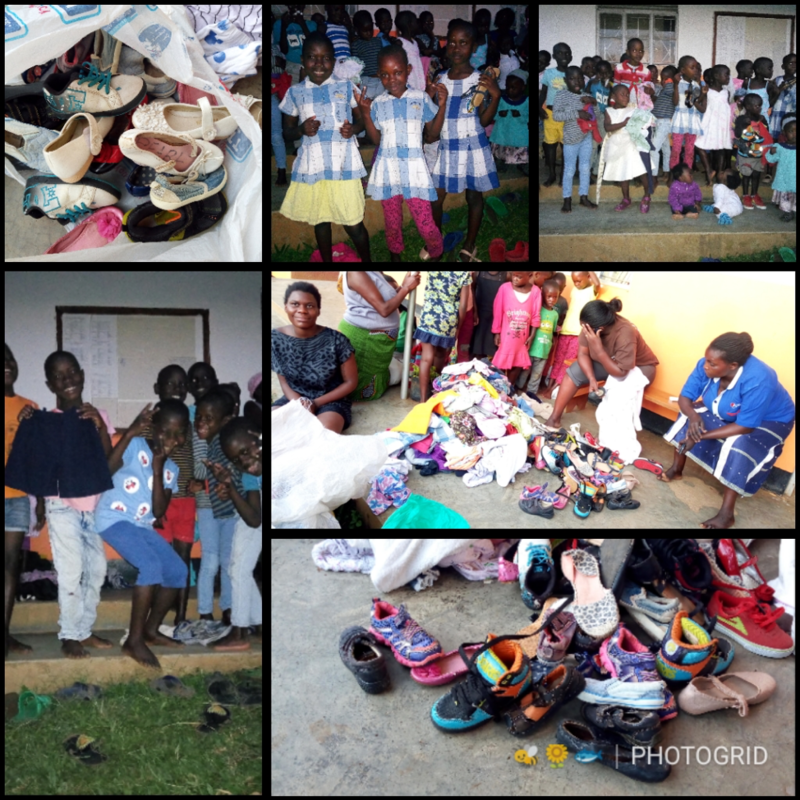 We received so many gifts from the donors last month for the children and these included shoes, clothes, art supplies, balls and sandals. 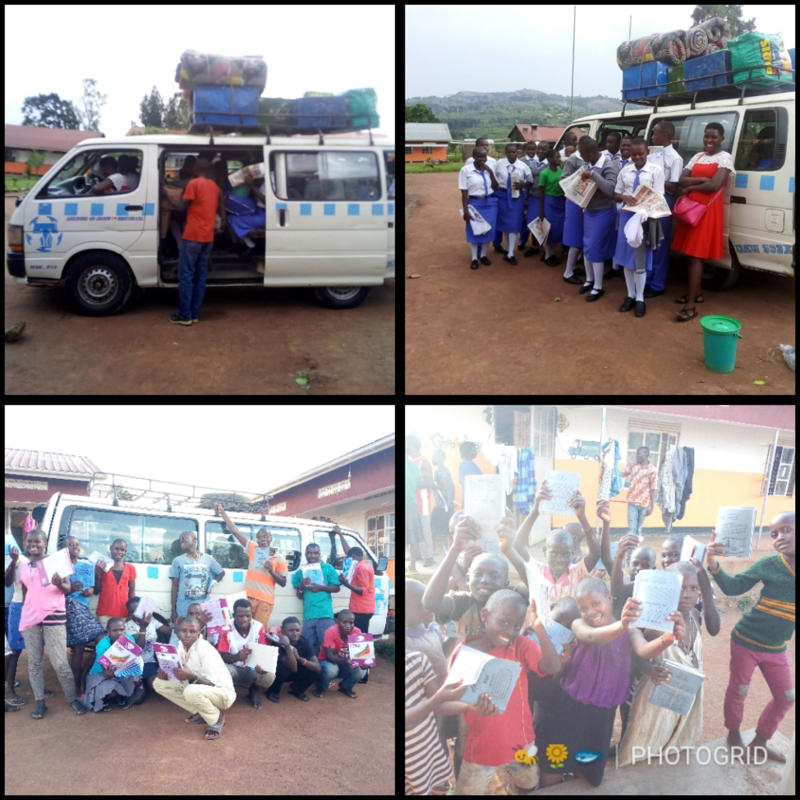 On 17th /08/2018 our children broke off for holidays. 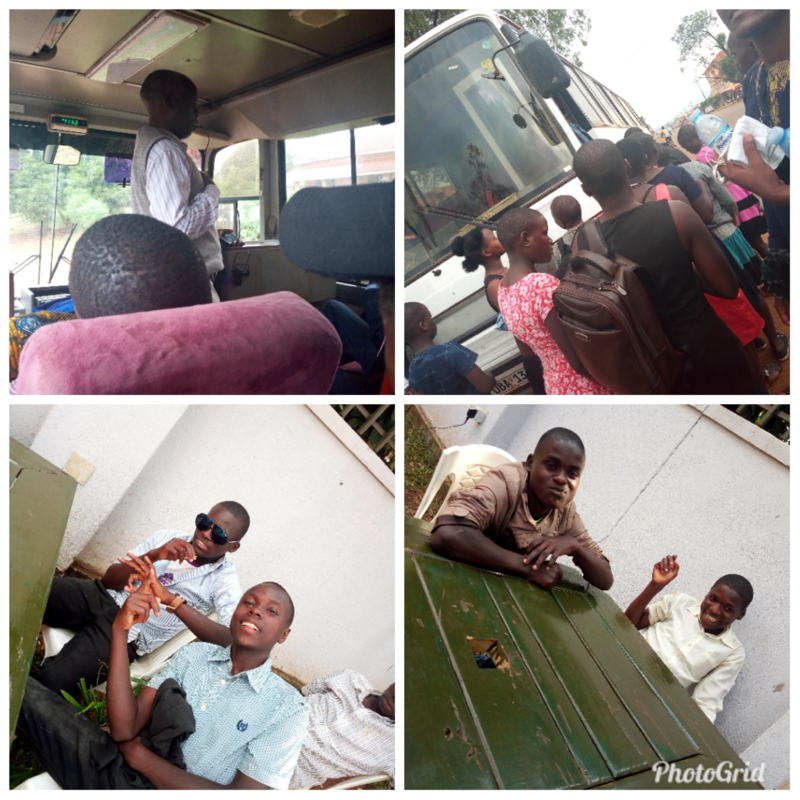 At least most of them got good grades and were promising as they study hard to sit for final exams to be promoted to another level. 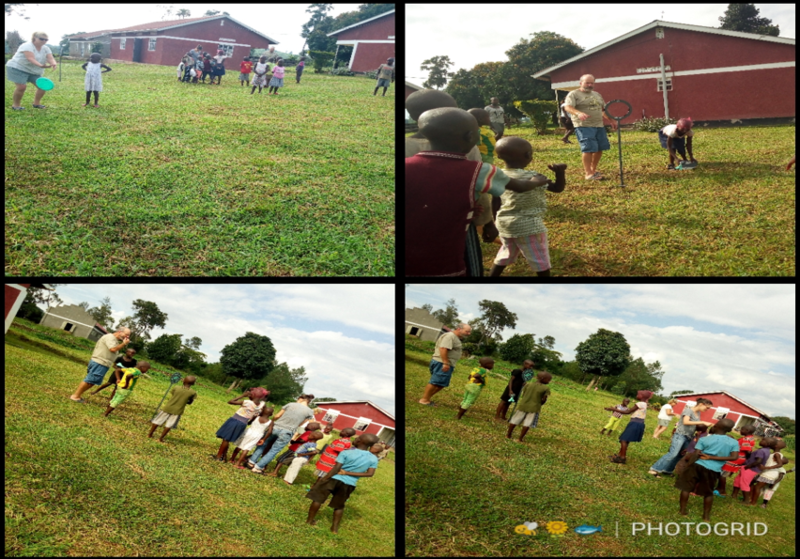 Below are pictures of our children at the orphanage and some under the guardianship playing and sharing love with sponsors. 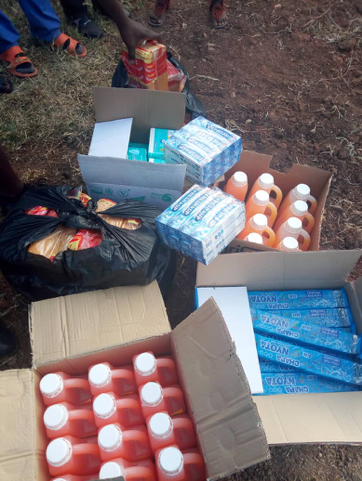 We are also grateful for the wonderful donationof biscuts, juice and clothes from Mr. Patel’s family. 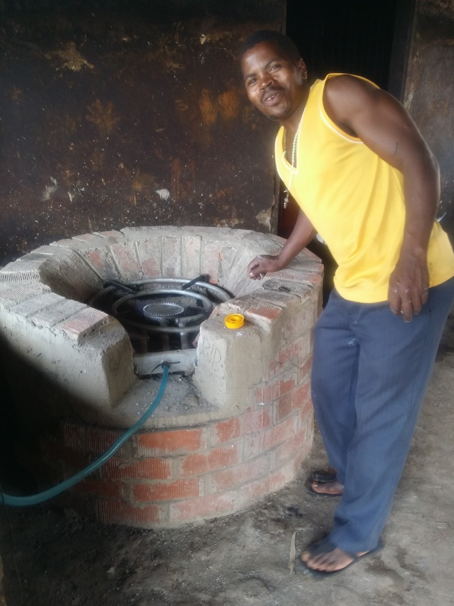 We cannot stop to say thank you to father David from the United States who visited our orphanage last year and donated a bio-gas plant to the orphanage. The project is doing very well. 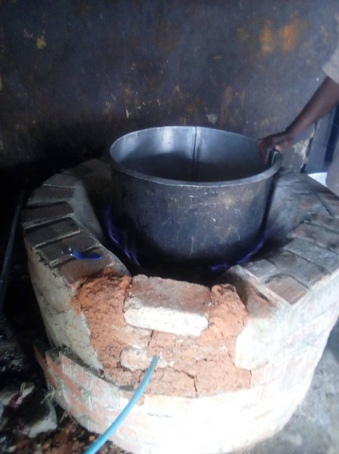 The system can handle boiling porridge, boiling beans and also boiling water for maize meal but we mingle from the stone. This has helped us a lot. We no longer send our children to go look for fire wood especially during a rainy season like this one. Our gardens have expanded. 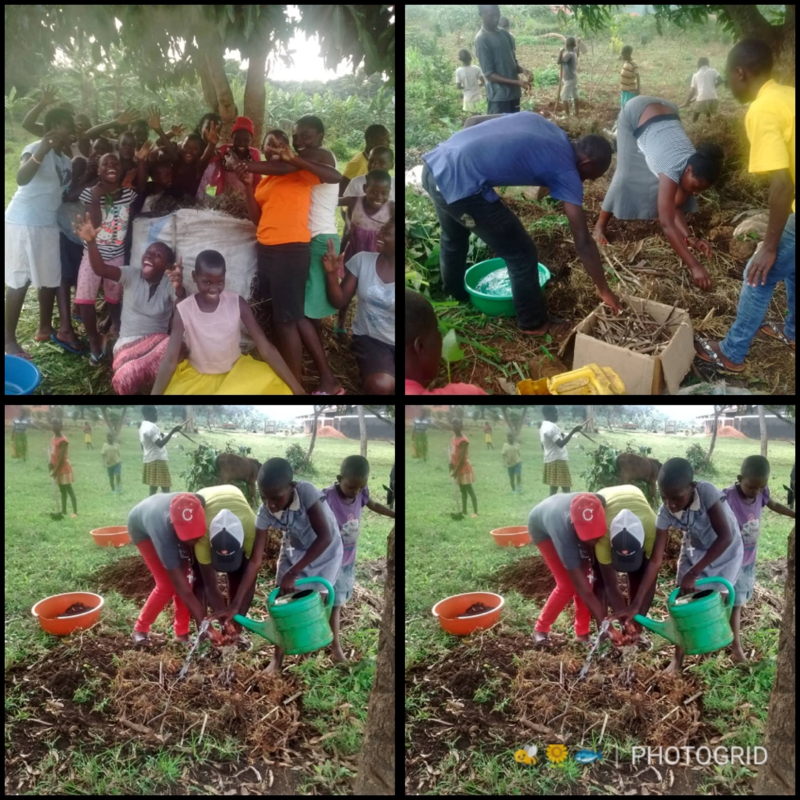 During the first term holiday, our children planted sweet potatoes by the help of the our agriculture asistant, social workers and the caregivers. This was to help us improve their diet. Its during this holiday that we started harvesting as shown below. 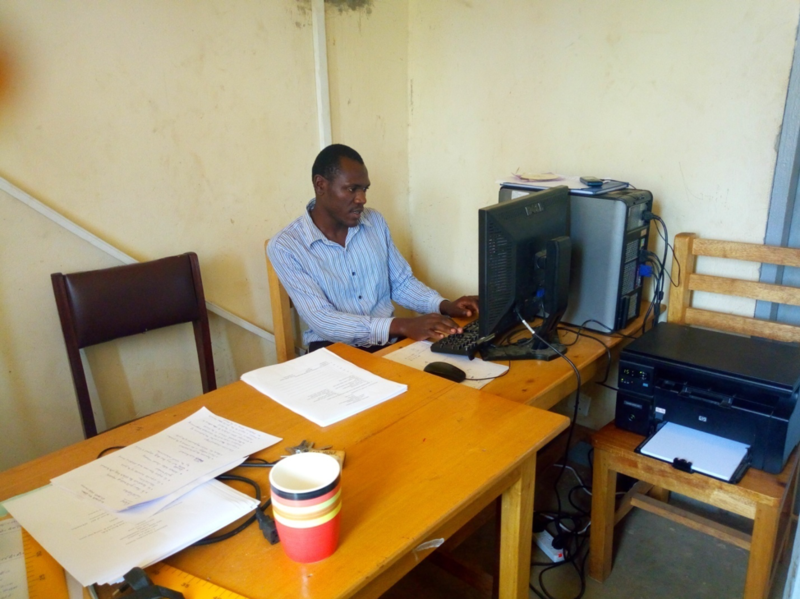 The management team remained behind after the students had left and the other teaching staff to plan for the coming term that also has so many activites like sitting exams such as for DIT and UBTEB for the first time here at the technical school. 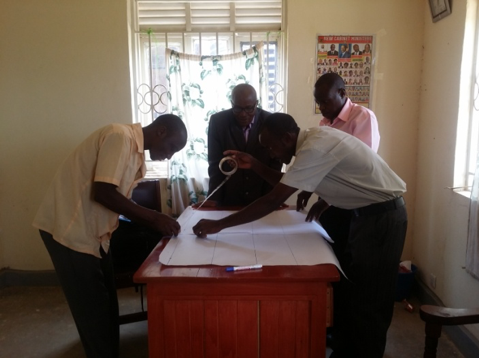 Below is the technical school management being helped by Fr. George William to plan for the coming term and they later posed the picture with Mr. Graham Townsend who had visited Miryante Village from New Zealand. We are forever grateful to everyone who is supporting us in any way. We are praying for you- thank you so much for all the help and love you have given us! We would like to extend our greetings to everyone out there and also to say thank you for the great support towards our projects. 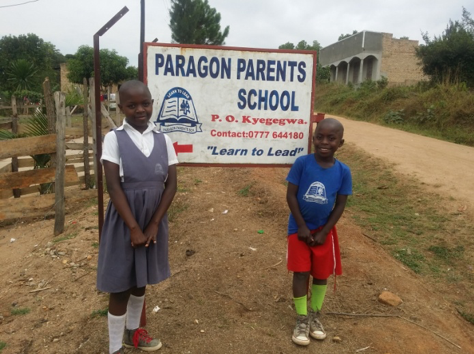 The children are doing well in their studies in all the different categories that we support and these include: primary under the orphanage, technical, secondary, guardianship and child-headed families. 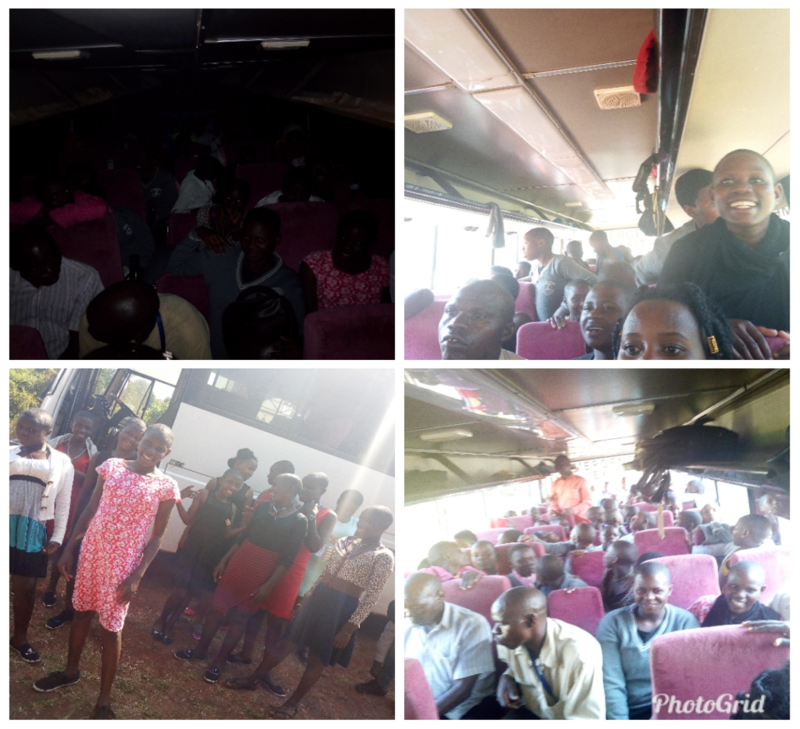 On 1st of July 2018 we visited our 22 students who study from King Solomon Secondary school. They were all very happy to see us. 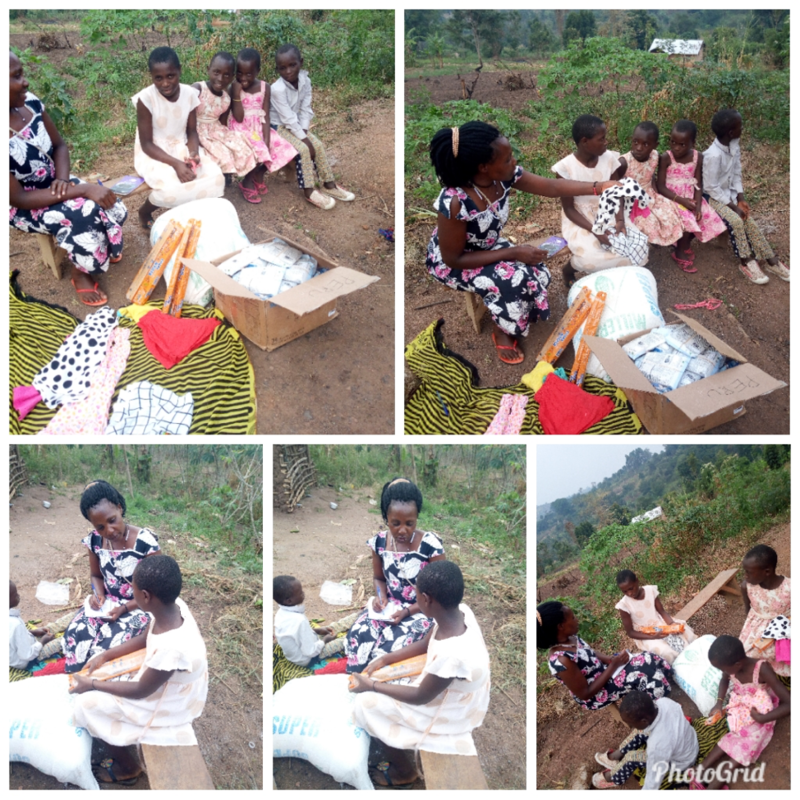 We also carried them a number of things for all of them and this excited them the more as you see the pictures attached below. Technical school! 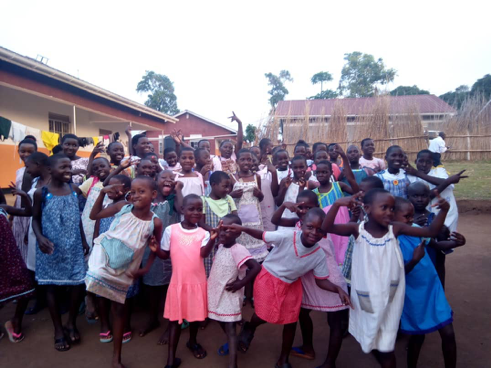 The school has a total of 91 students of which 23 are from the orphanage and the 68 are from the community. 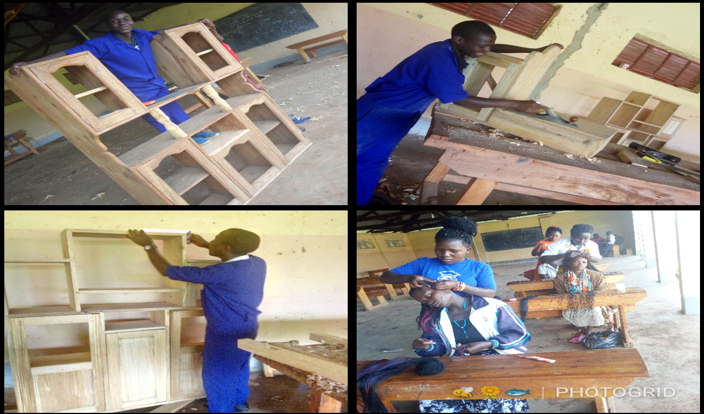 Below are some of the pictures taken from the Building class, Carpentry, Tailoring class and hair dressing class. 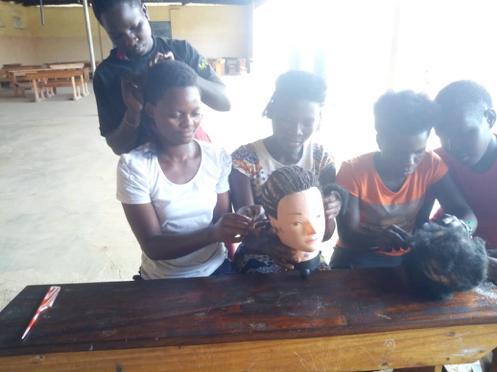 Child-headed family program under Kyakak II refugee camp is doing well at with 30 children receiving services under this program. 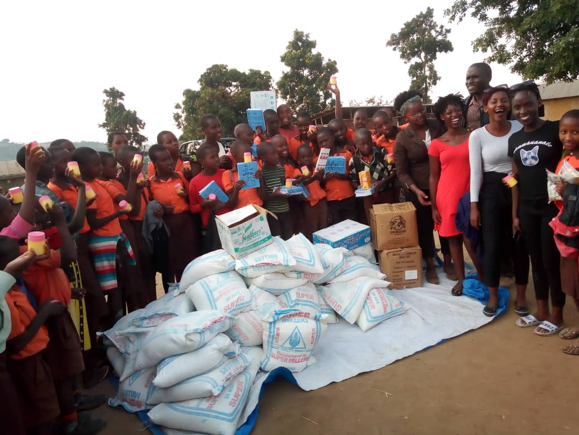 These children receive three meals a day. 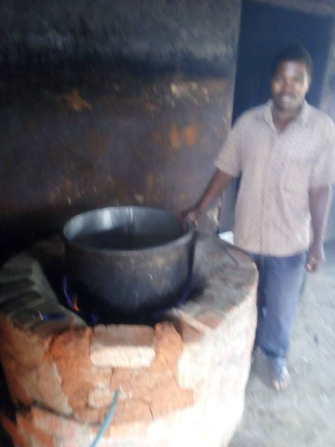 It’s not only food that we provide. 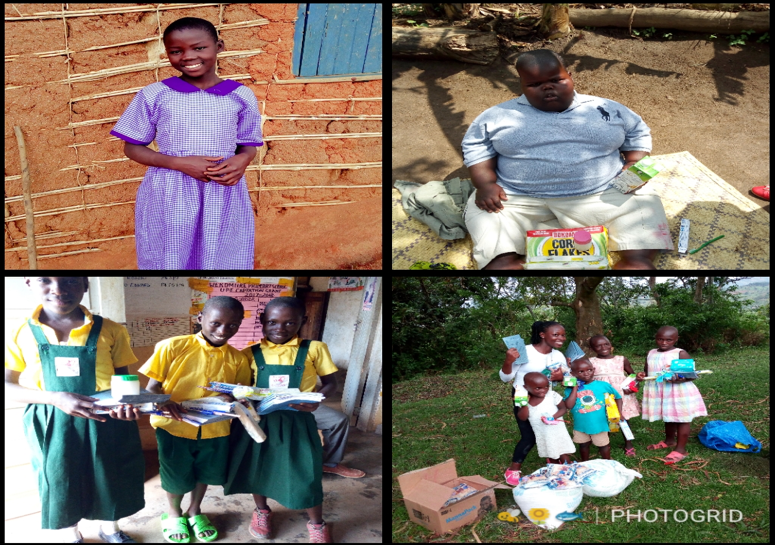 We do also give them scholastic material to help them keep in school. As you see them below, they all look happy. 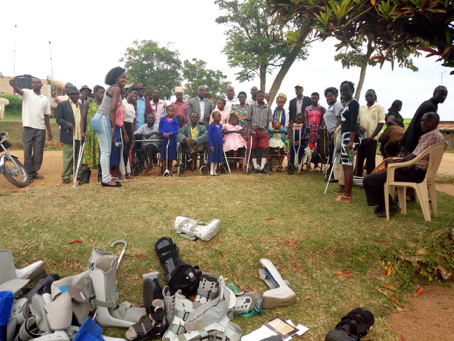 Through Miryante Orphanage we were able to help distribute mobility devices for people with disabilities in Kyegegwa District through donations from Crutches For Africa. 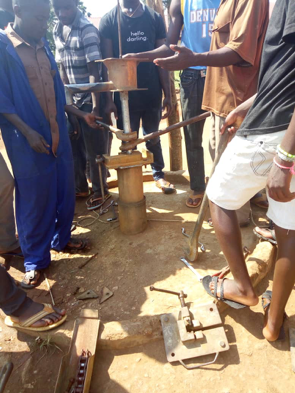 We couldn’t wait to update you about our Bio-gas project. This was a donation from Fr. 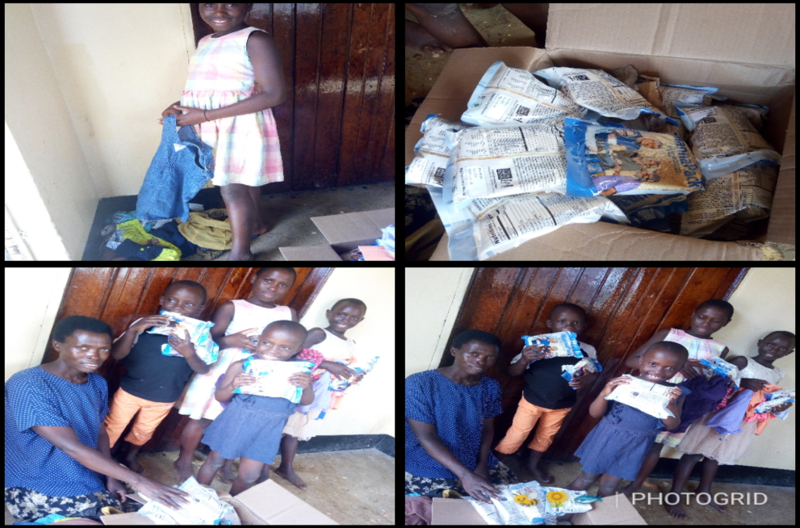 David who visited last year from USA and other missioners that saw this need at the orphanage. 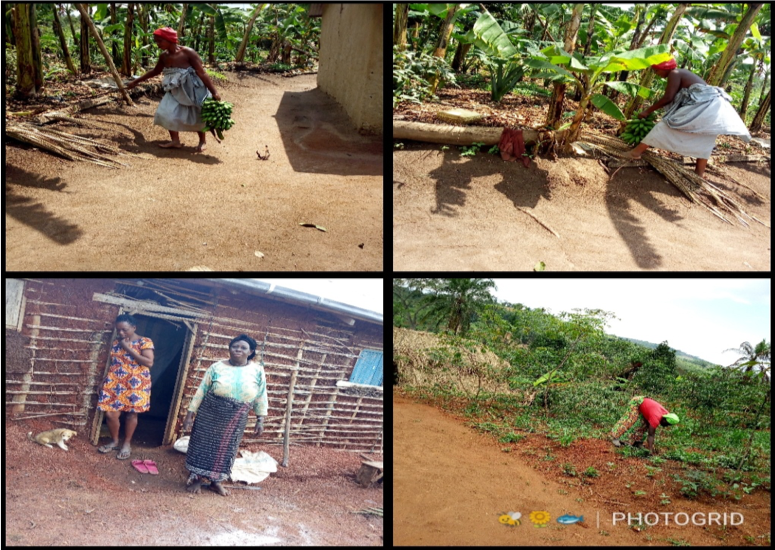 We are so grateful for this project because finding firewood has been a big problem. 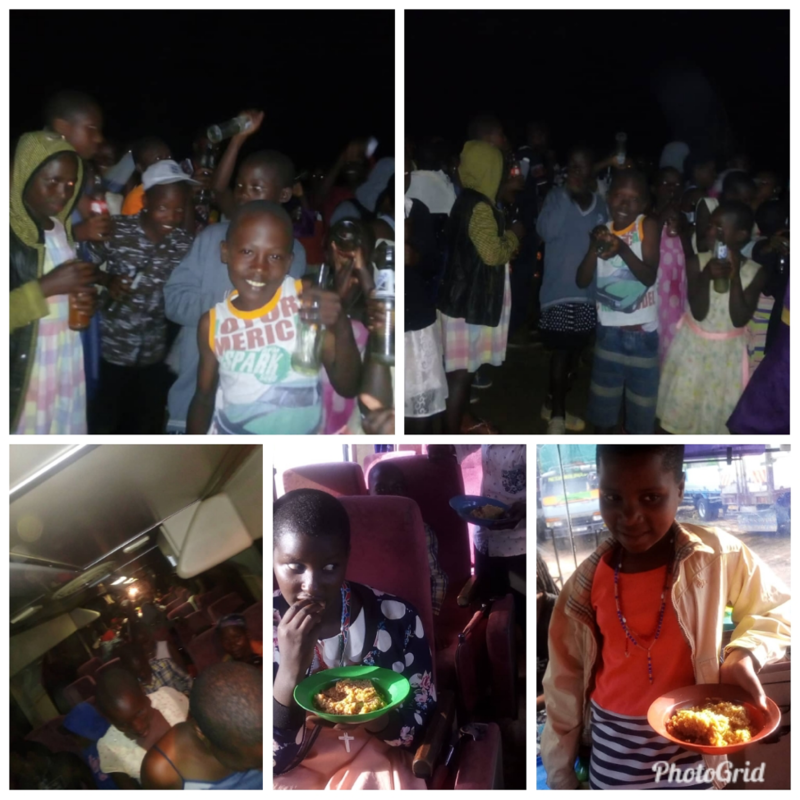 We are now sure of the kids are not going to be missing meals. 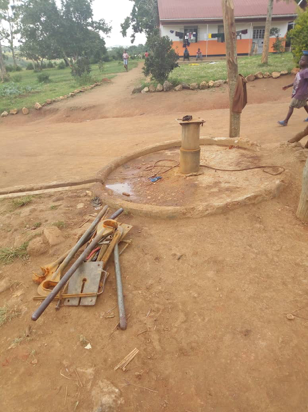 We are so grateful for the borehole repairs done by Inno-Pak Company. 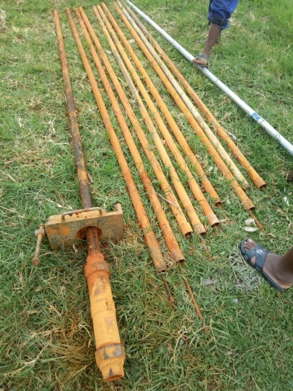 Our borehole has been giving us giving us water with a lot of sediment until we got this donation to work on it. 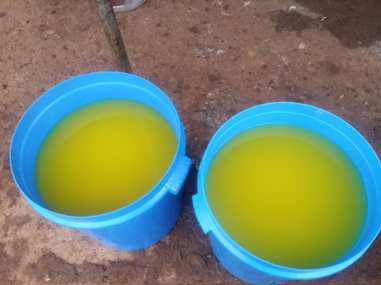 We are happy to inform you that the water we are getting now is very clean due to the repairs. 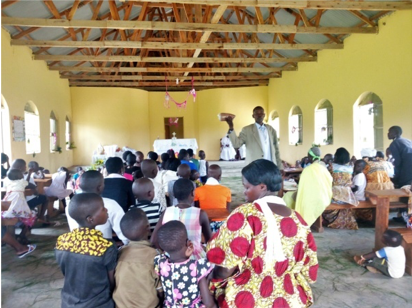 We would also like to expend our sincere thanks to St. Peter’s Catholic Church Ohio for the great donations they have made towards Miryante church and in this includes: 50 Benches, and 15 frames with pictures showing the stations of the cross. 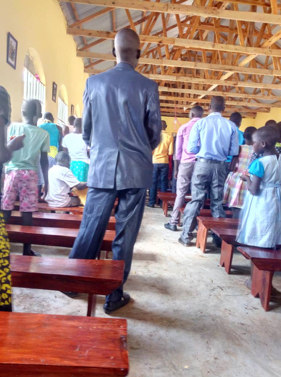 Our children now no longer have to carry desks from the classroom and the dining hall to the church to use since there is a distance to the church and the kids were also accidently breaking some of the desks when they were carrying them. 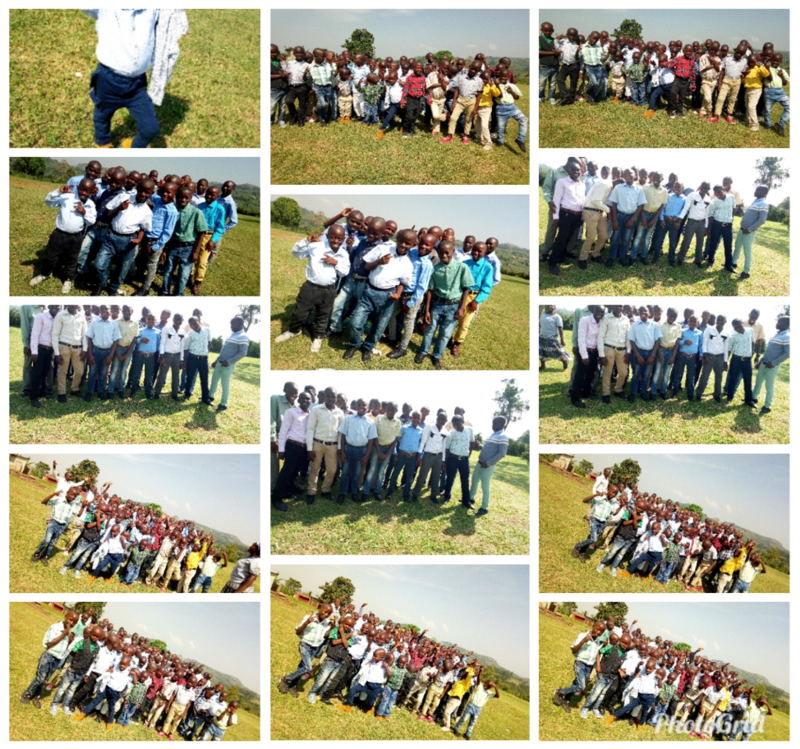 The month of July ended in a style here at Miryante. On Sunday the day started with a heavy breakfast. 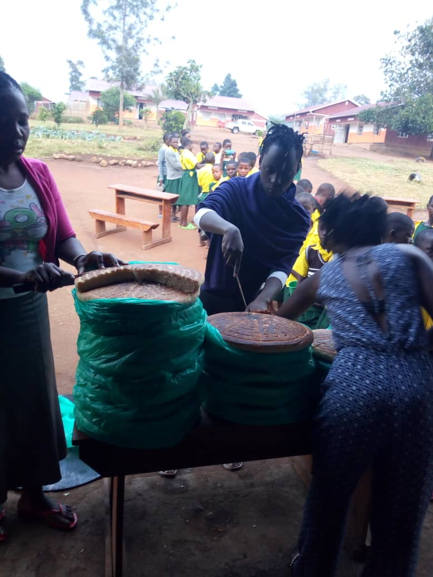 The children made for themselves chapatis and porridge with Milk. 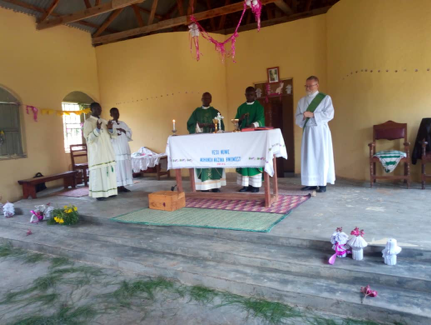 We had mass then led by Father Amooti from Kakabara parish and the Director with the help of a Deacon Reed from Ohio. 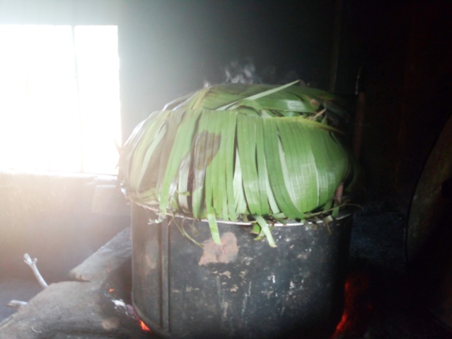 We later had heavy lunch which included: Matooke, Milet bread, Soda, Fish and G.nuts, Beef (we slaughtered one of the bulls), Rice, Irish potatoes and greens. Below are the pictures. 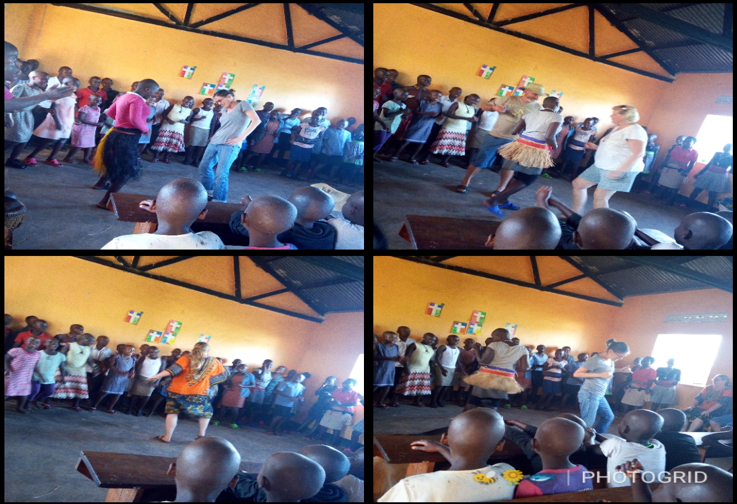 After lunch we had a danced organized by the mission group and a number of gifts were given to the kids from Laura’s family and friends, some from Kampala and others from the USA. 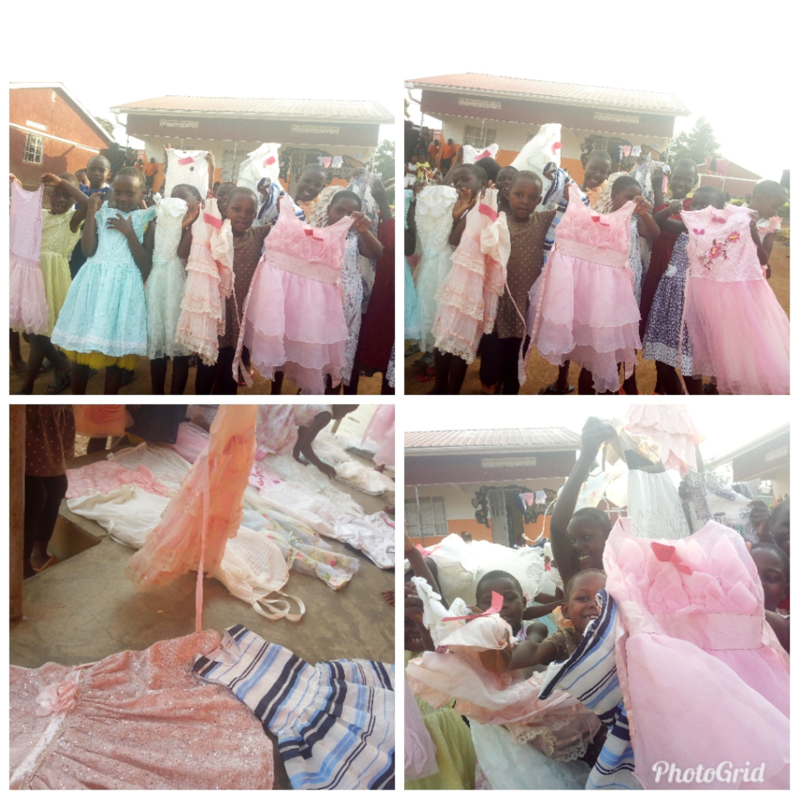 These included big cakes, Ice cream, Handkerchiefs, sweets, art supplies, shoes, sandals and dresses donated to all the girls by Mrs. Karla Kensey, Eritrean Bread and many others. We later had an introduction and giving away of our own Laura Corcoran to Mr. Ambish Patel. The function was so colorful which ended with a dance. We feel blessed already for loving us that much and for having all of us at heart. We can’t stop praying for you all every day. 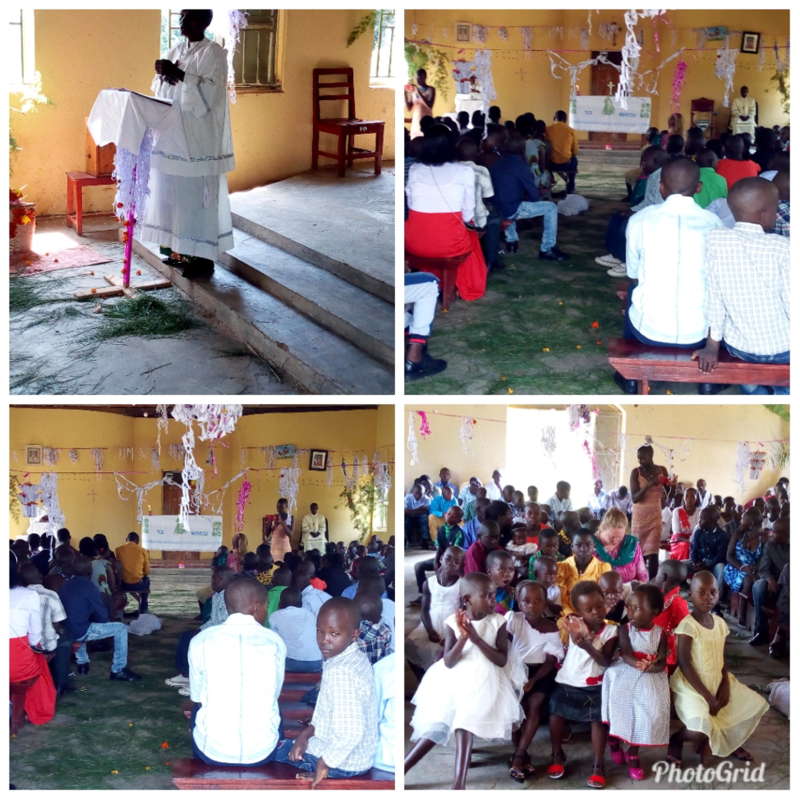 April was such a wonderful month with our Easter celebration. The celebration was so wonderful we felt changed after. The celebrations came along with a lot of stuff such as mass. 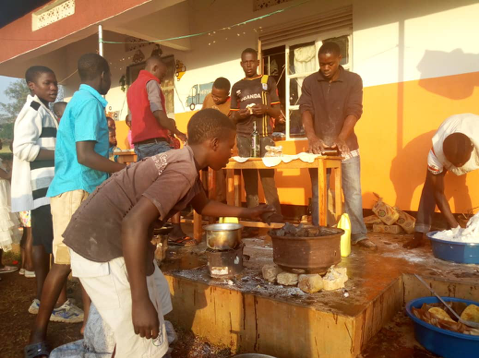 After mass we had different meals such as matooke, rice, meat, pork, fish, G.nuts and soda. The whole celebration ended with a dance. A huge thank you to the Baker Family for sponsoring our Easter meal! The gardens are doing well especially during this rainy season. Our volunteers are doing a great job. 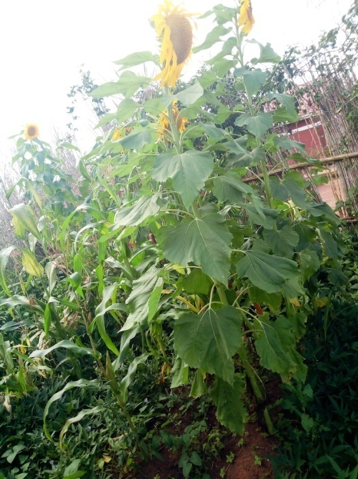 Alex, our Peace Corps Volunteer, planted sun flowers that she will be harvesting soon. 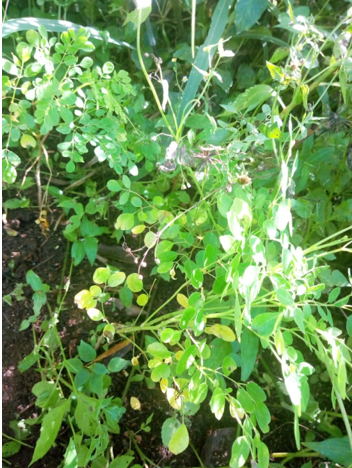 Laura also introduced a new tree called a moringa tree that can be used to help improve the children’s nutrition. 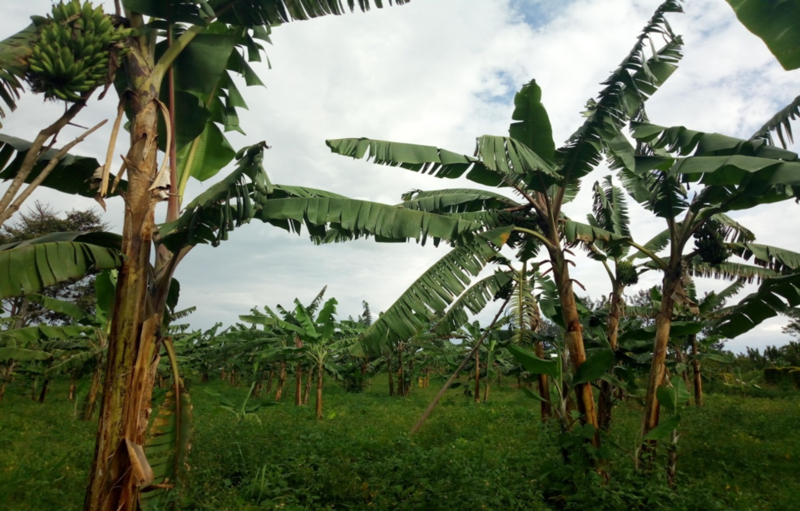 The banana plantation is doing well. 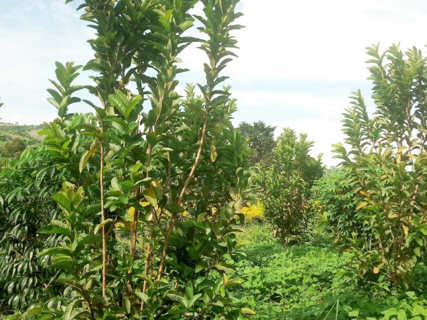 The guavas have also grown, as well as plenty of papayas and pumpkins as shown below in the pictures. Our children in King Solomon broke off for holidays. Their performance was good and we are sure they will be of help during this holiday. 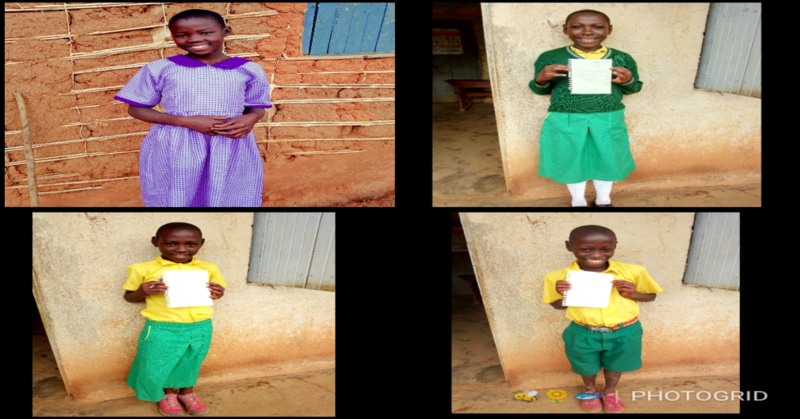 Thanks to everyone for helping us meet their school requirements and fees. 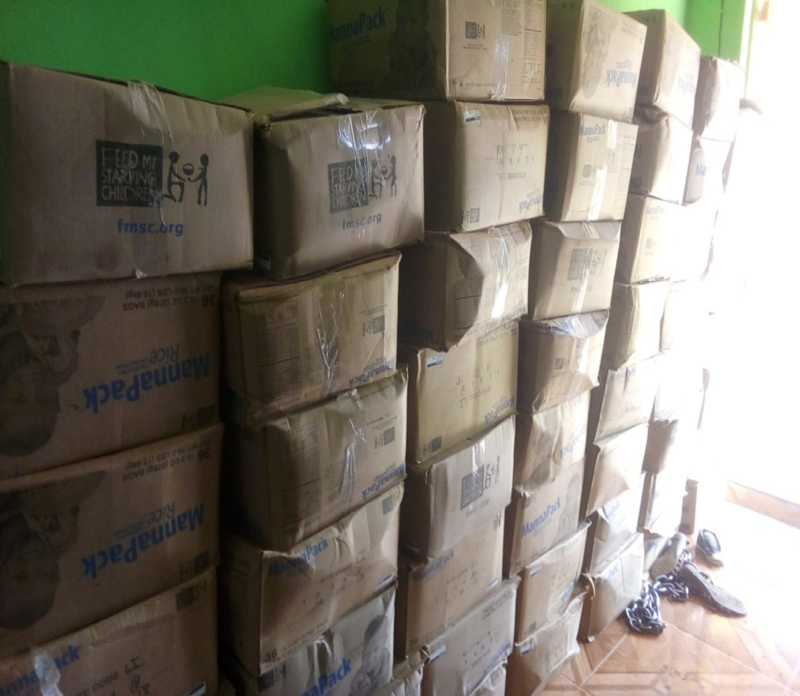 Thanks very much to everyone that is helping us meet Miryante’s children’s basic needs. We would be completely nothing and nowhere without you. God Bless.